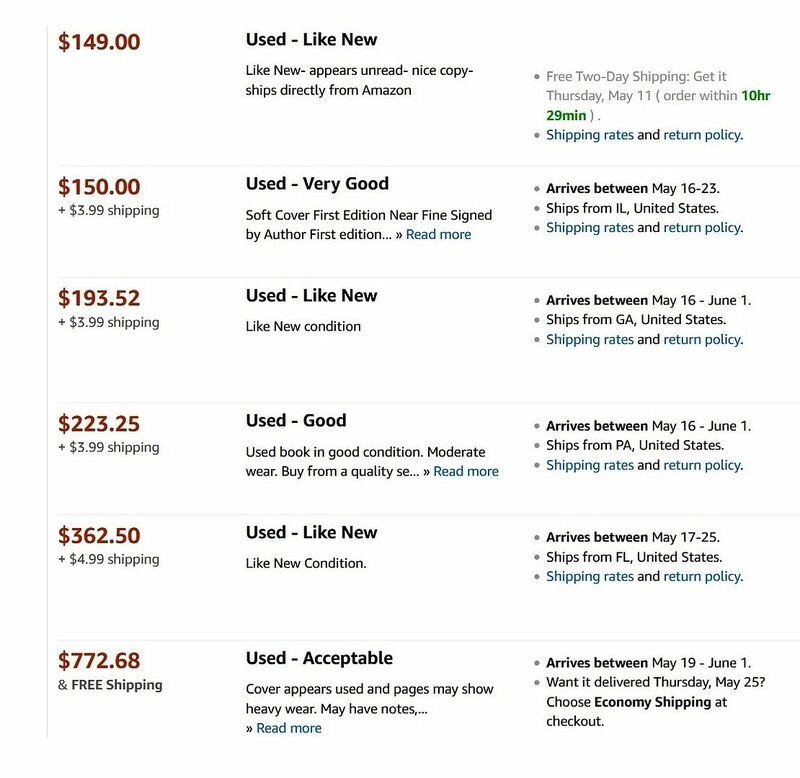 In the last 20 years, I’ve probably received more than 200 emails and inquiries from folks who think they’ve found a Sears Magnolia. 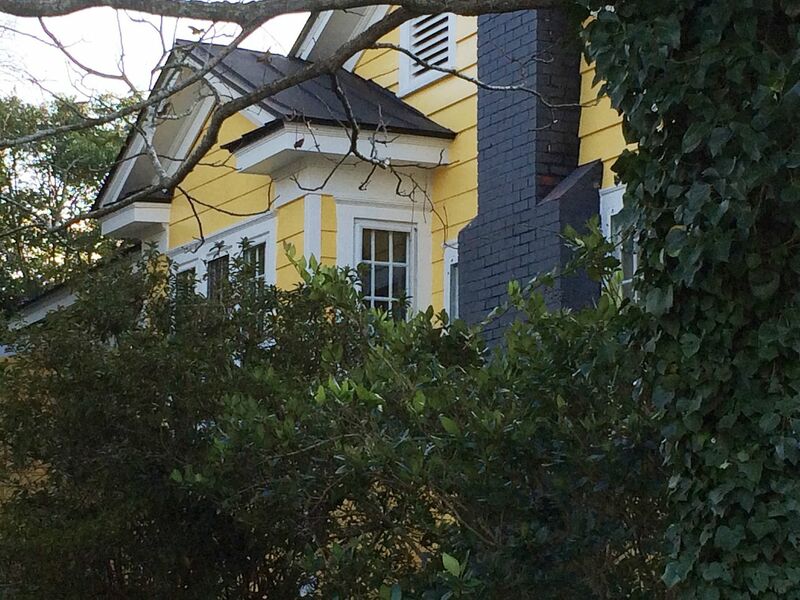 In the last 20 years, I’ve found four Magnolias as a result of these emails and inquiries. That means that 2% of the time, these comments are correct. And yet, I still feel a rush of adrenaline when someone leaves a comment stating that there is a Sears Magnolia at (fill in the blank). 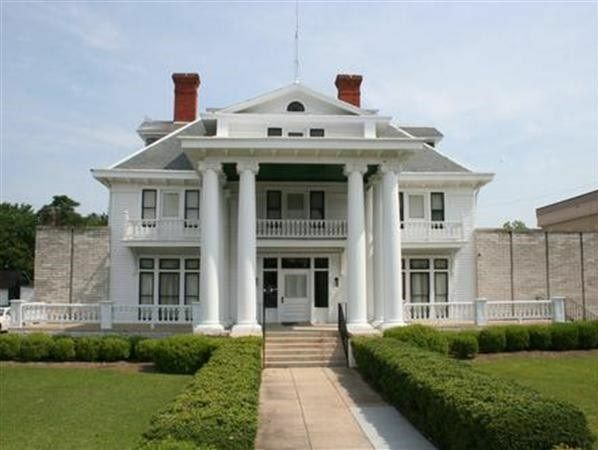 This morning, as I was preparing to write a blog on Penniman’s people, I found a fresh comment from someone stating that there was a Sears Magnolia in Hawkinsville, Georgia. Immediately, I assumed that they must be right and abandoned the blog I’d been working on to investigate this purported sighting. Again, it was not a Magnolia. And yet, this one was closer than most. 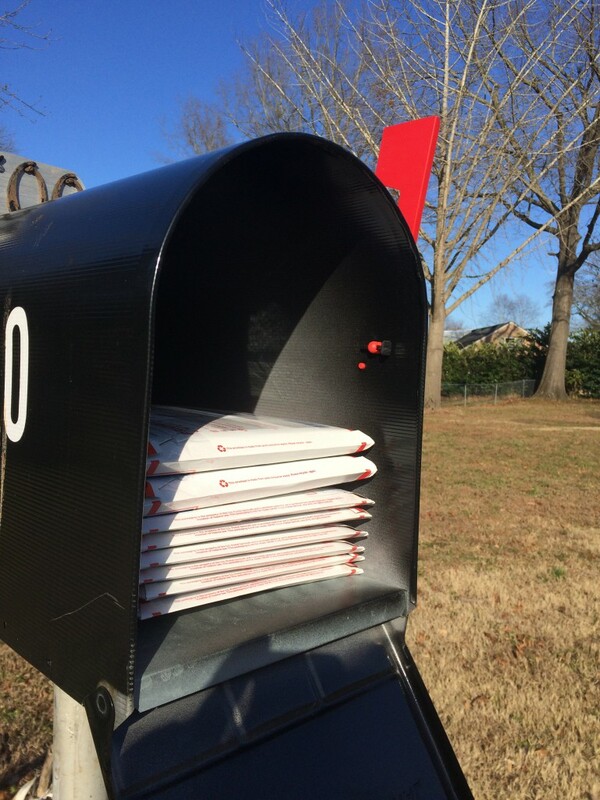 Please keep those cards and letters coming. 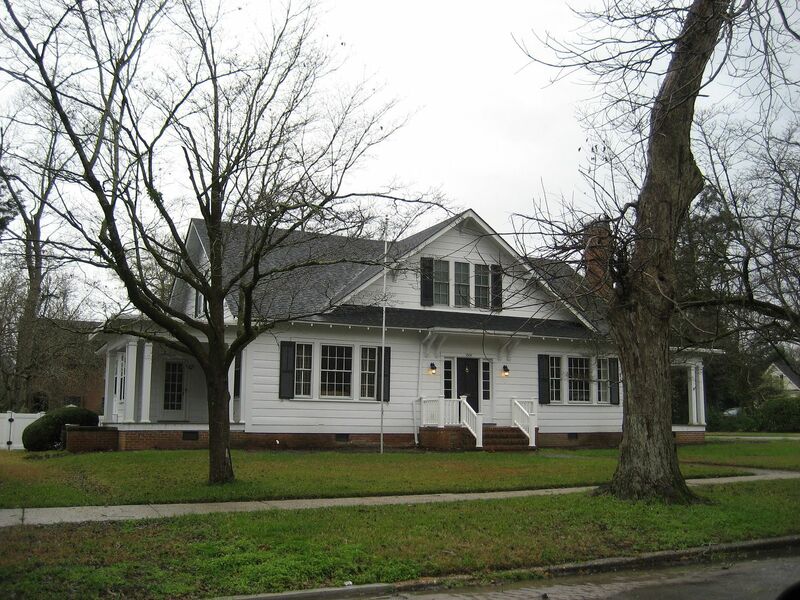 Even the little town of Poquoson has a few kit homes. 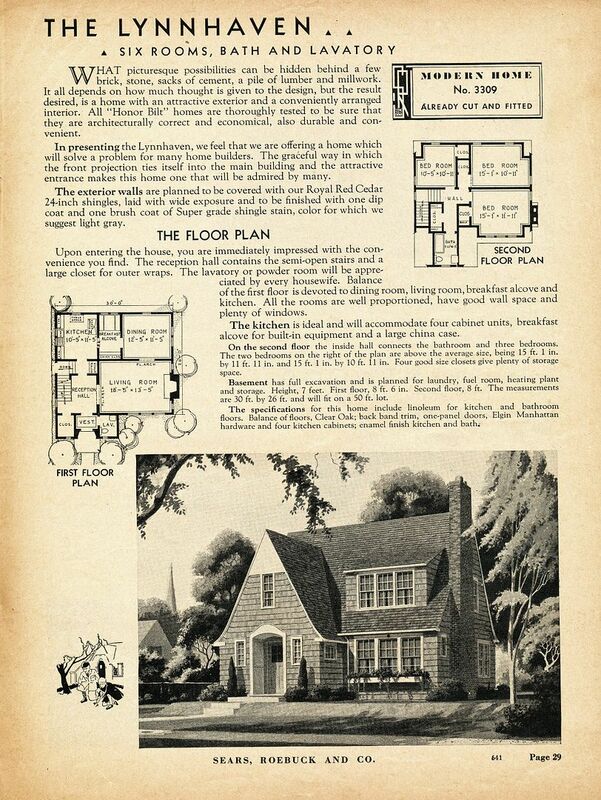 The Sears Magnolia was probably Sears fanciest model. 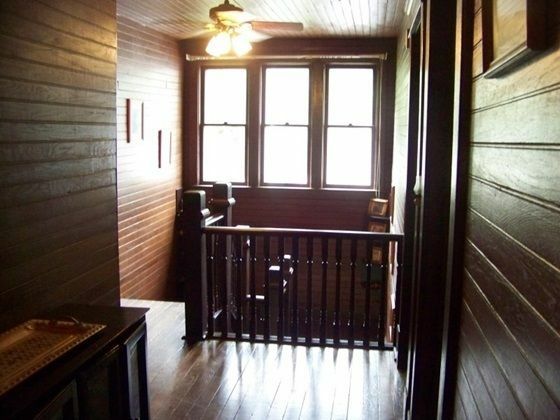 It was offered from 1918 to 1922, and sold for less than $6,000. There are only nine known Magnolias in the country. First, the real deal. 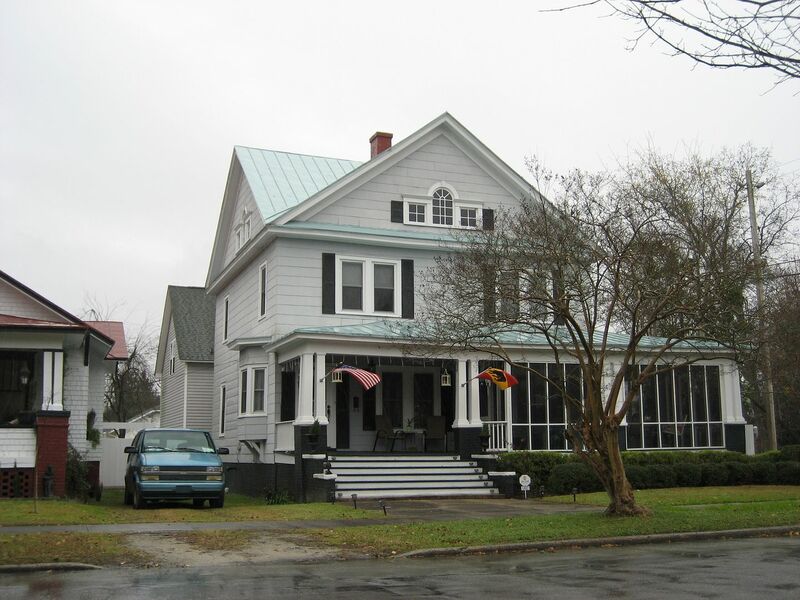 This is a known Magnolia in Benson, NC. 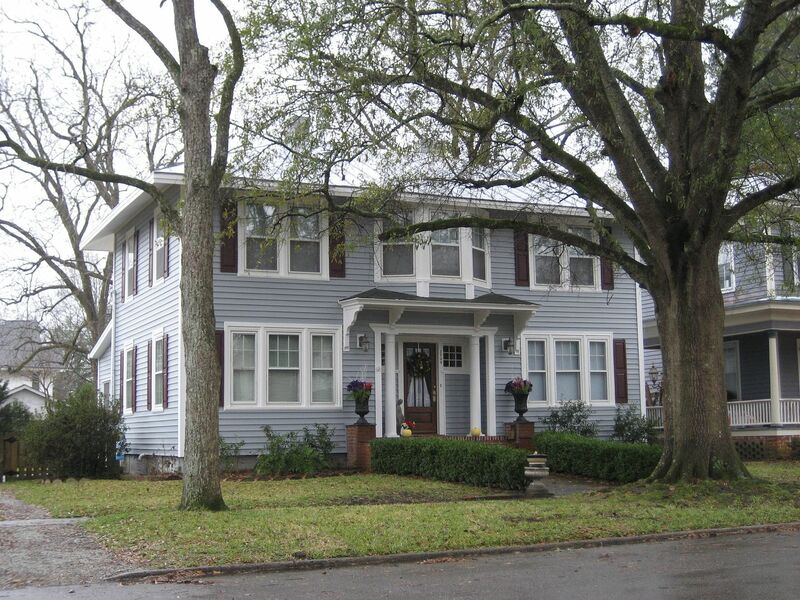 In 2003, I appeared on "History Detectives" (PBS) and this Sears Magnolia was briefly featured (Canton, Ohio). 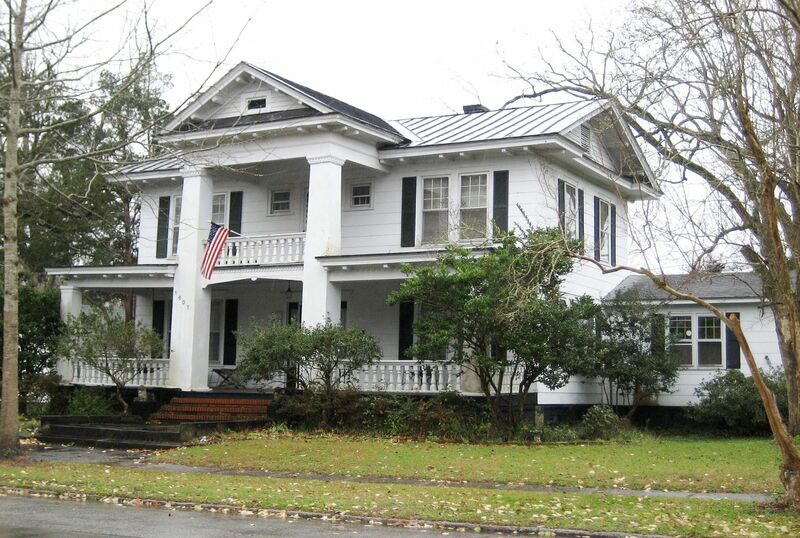 A reader mentioned this "alleged" Magnolia in Hawkinsville, Georgia. I'm sorry to say that this is NOT a Magnolia. 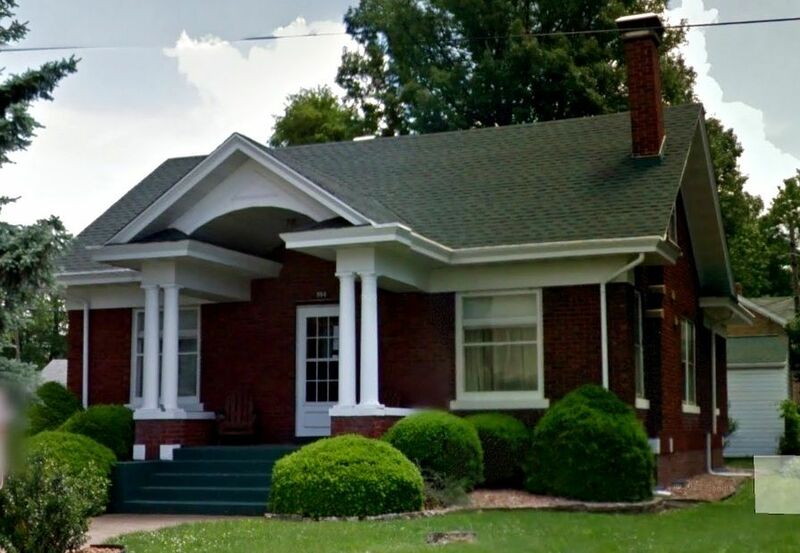 This building is currently in use as "Clark Funeral Home" and this photo is from their website and here's hoping that they're okay with me promoting their beautiful old house on my blog. 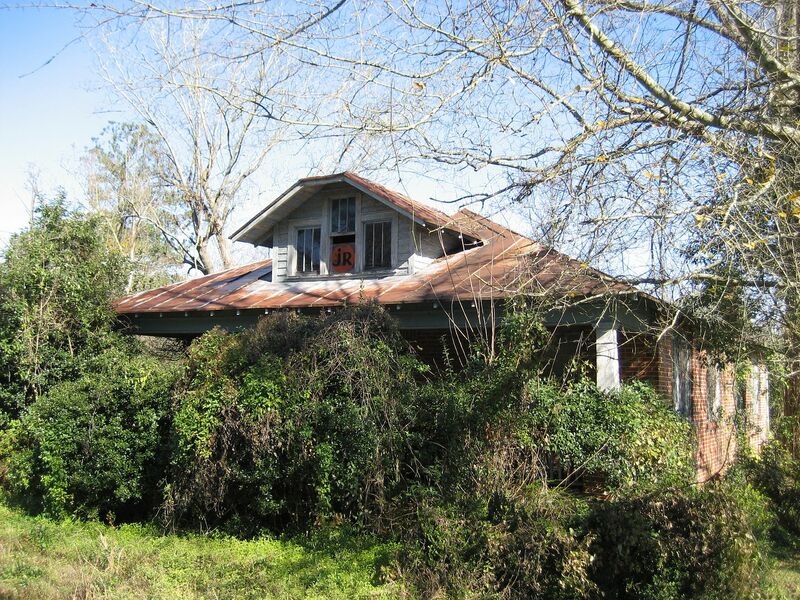 And it IS a beautiful old house, but it's not a Sears house. 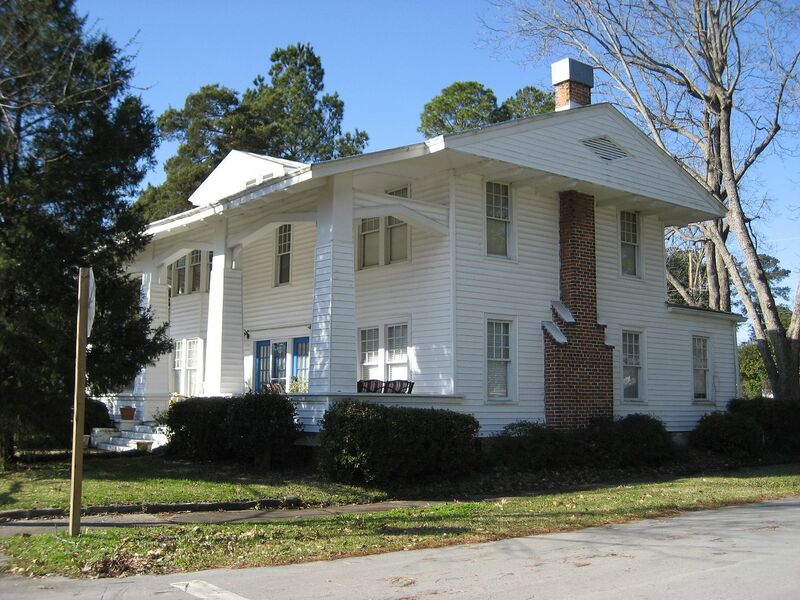 Interested in learning more about Clark Funeral Home? Click here. 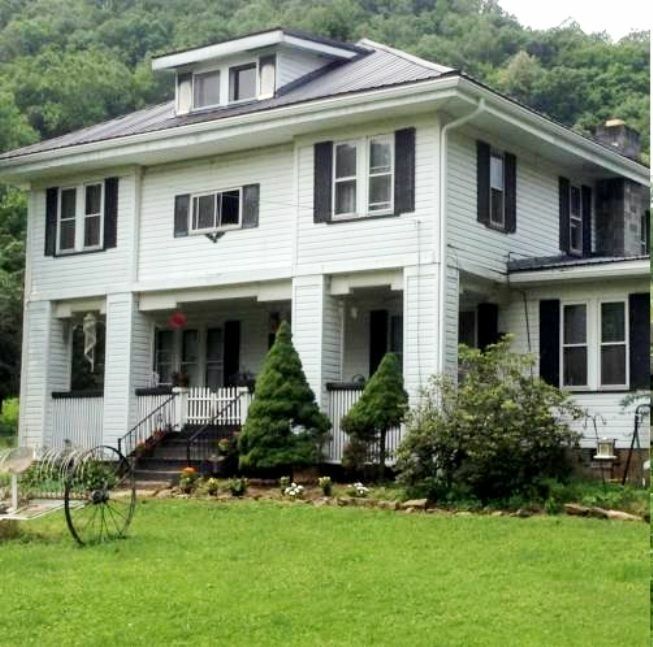 Last week, I traveled to New Martinsville, West Virginia to see what was purported to be the 9th Magnolia. 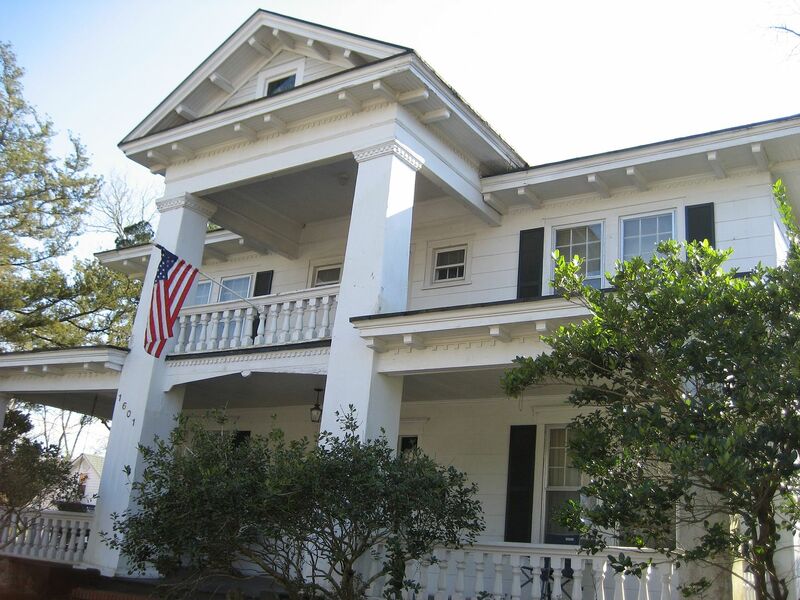 Prior to this, there were only eight known Magnolias in the country. 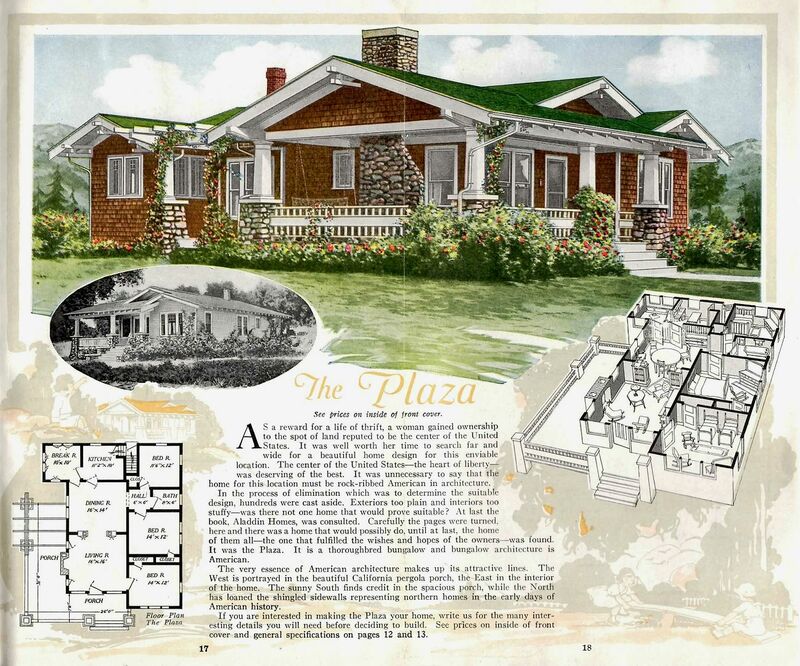 The Magnolia was the crème de la crème of Sears Homes, with countless accoutrements and fine features. To read more about the other Magnolias, click here. The eight-hour trip to New Martinsville was quite lovely and the weather was beautiful. 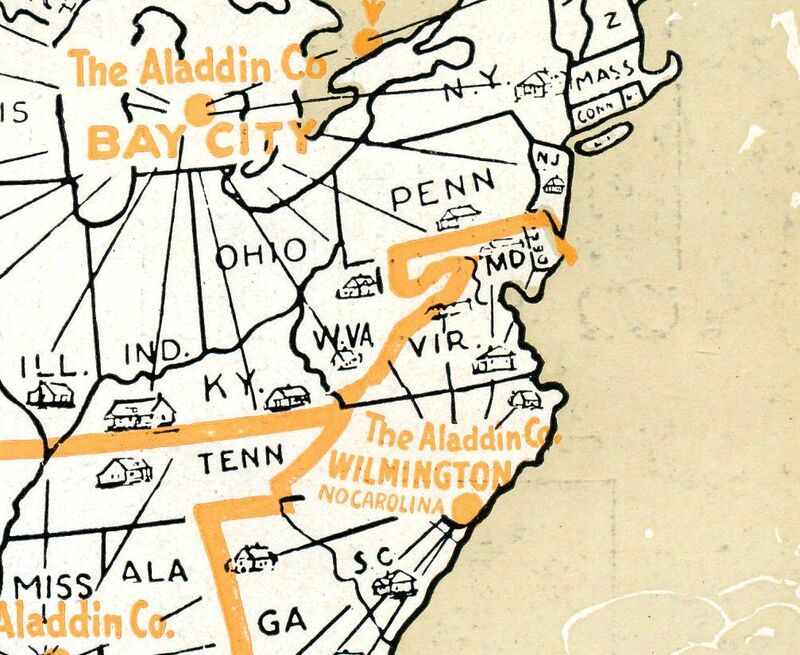 After examining the Magnolia in New Martinsville, I traveled to Elkins to visit Wayne’s family, and then on to Hampton Roads, Virginia. It was the trip from Elkins to home that went very badly. It should have taken less than 90 minutes to get from Elkins to White Sulphur Springs (and the interstate), but it took more than three hours. I was as lost as I’ve ever been and frankly, utterly terrified. No cell service for three hours, and not one, but two Garmins that kept sending me around in circles, and roads that were as hazardous as any I’ve ever seen. At one point, I went around a hairpin turn a little too fast and hit a very slick mudslide. This area had three days of non-stop rain. I hit that mudslide and lost control of the car. And - like so many places in them thar hills - there were no guardrails. In that split-second, I really thought that I was a goner. And in another split second, it was over. It was harrowing. Had it not been for a small store in Belington (the first town I encountered), I’d probably have ended up on the back of a milk carton, lost forever in those hills, foraging for berries and edible bugs. It’s a puzzler. A real mystery wrapped inside an enigma. 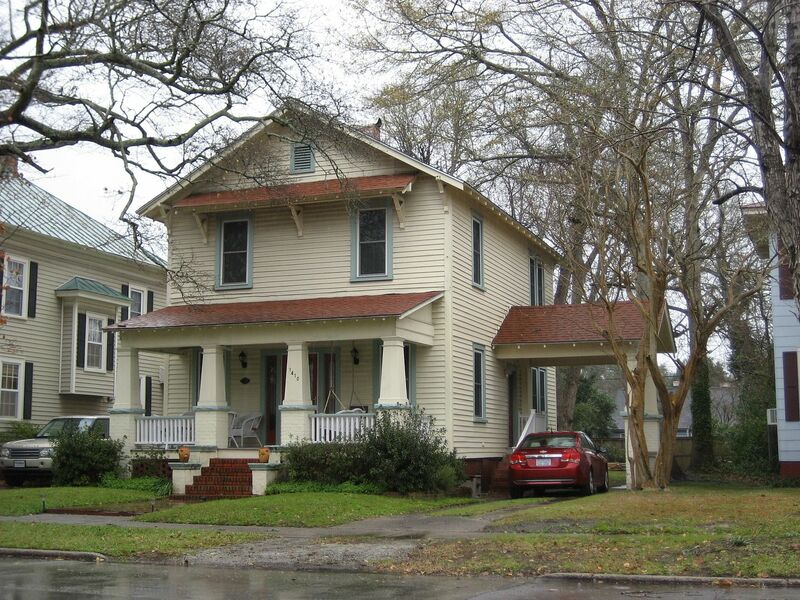 If you have an opinion on this house, I’d love to hear it. 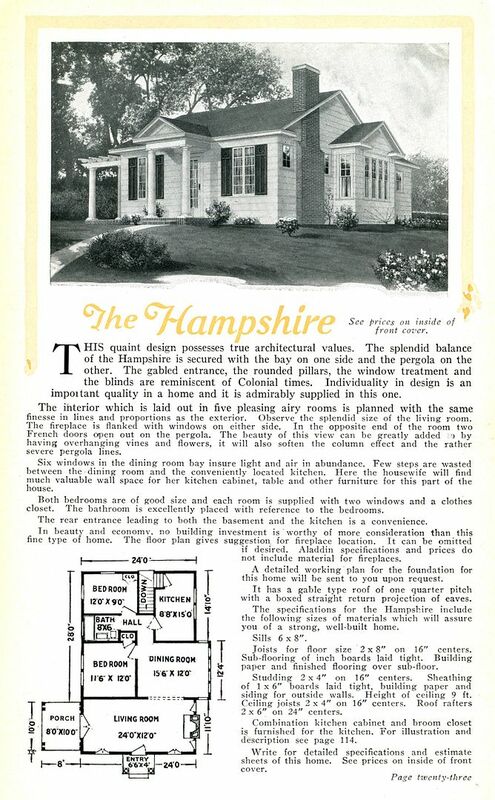 Today, I’m of the opinion that the house was a custom-order from Sears, but that the framing lumber was obtained locally. 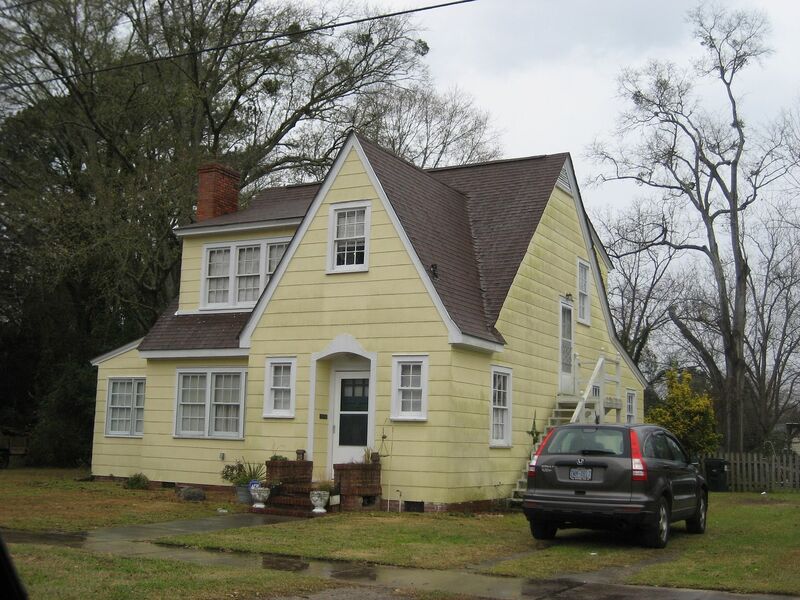 I searched that house top-to-bottom for marks, stamped lumber, shipping labels and yet could find nothing. 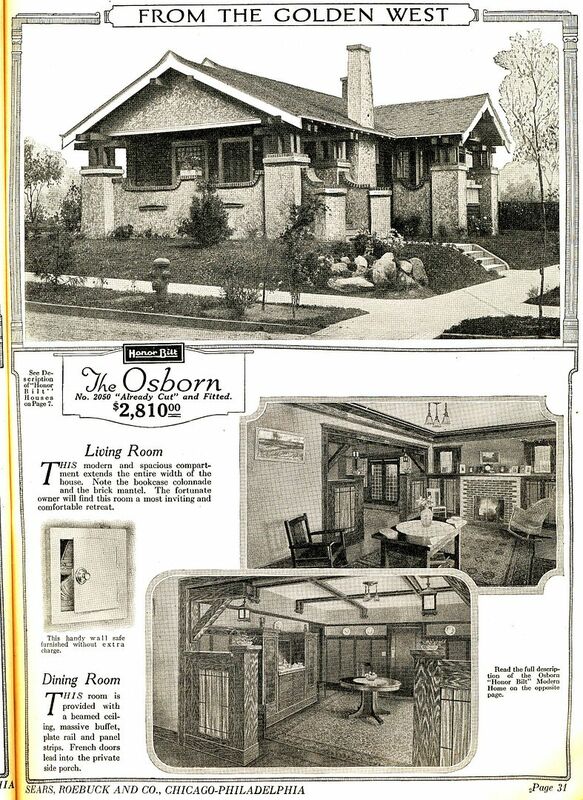 And yet, the house has Sears hardware (see pictures below). 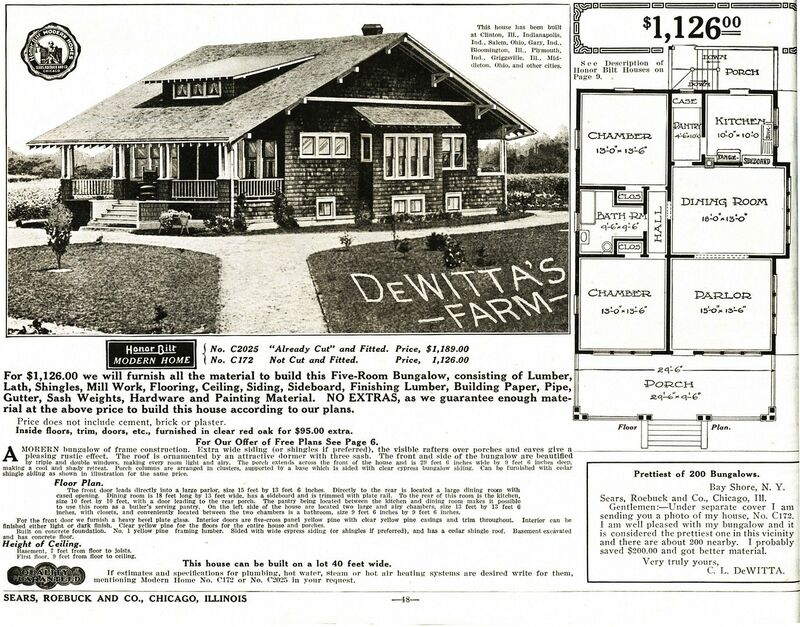 And it was built sometime after 1930. 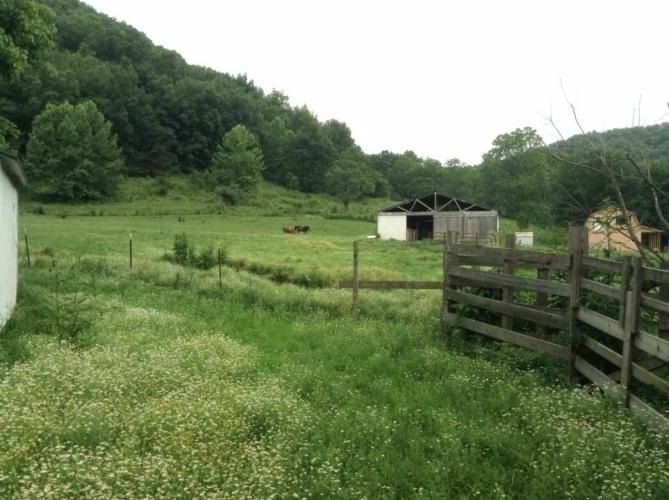 Please take a look at the images below and share your insights! 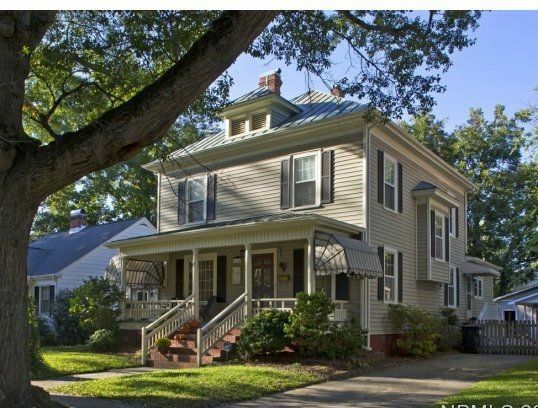 It’s for sale! 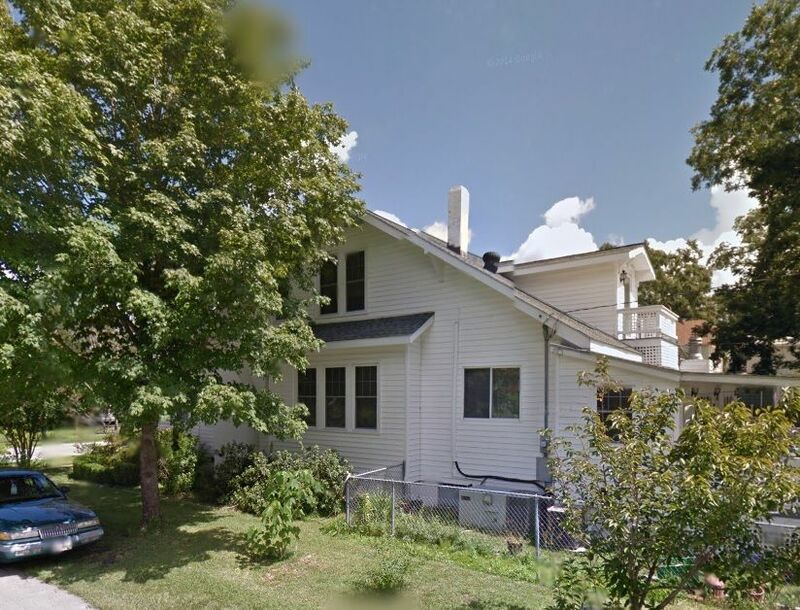 Click here to see the listing! 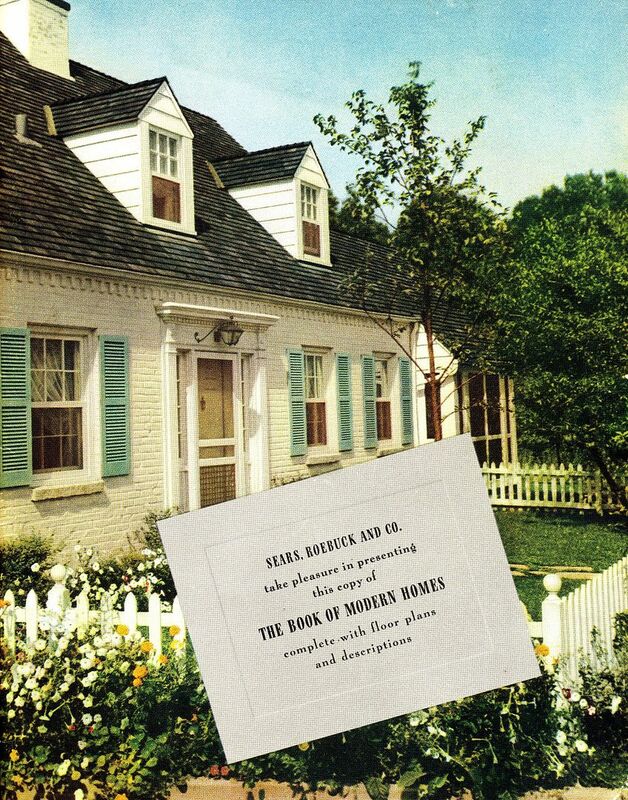 Read more about the Sears Magnolia here. Thanks to the Nebraska State Historical Society for the vintage photos of the Magnolia in Lincoln, that has since been demolished. To read more about this Magnolia, click here. 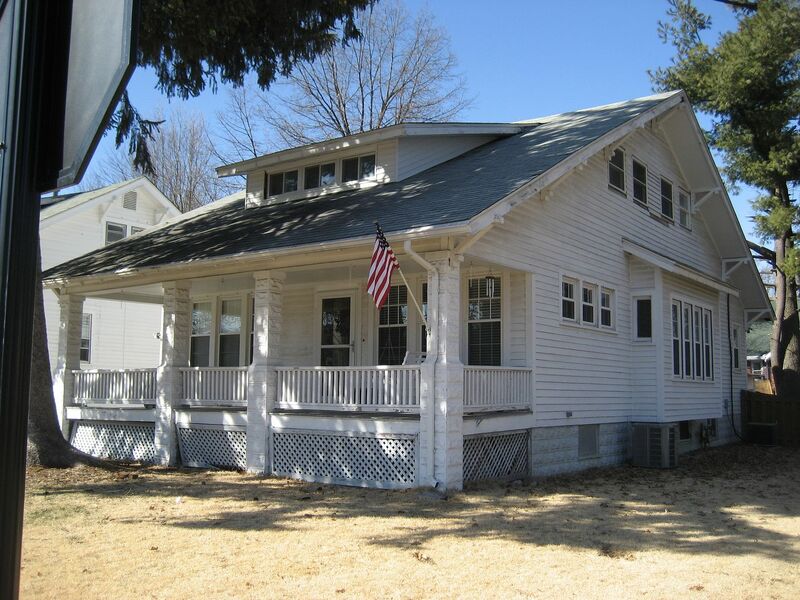 The original blog on this house can be found here. If you enjoyed this blog, please share the link on Facebook. In 2003, I dated a nice fellow who did website setup and design. He was far more interested in kit homes than he was in me, but he offered to set up this website. It would have been about 2004 (give or take a year). He was cooked and done after one date, but his website lived on, until 2010, when JASE GROUP redid it. (No dates were involved.) 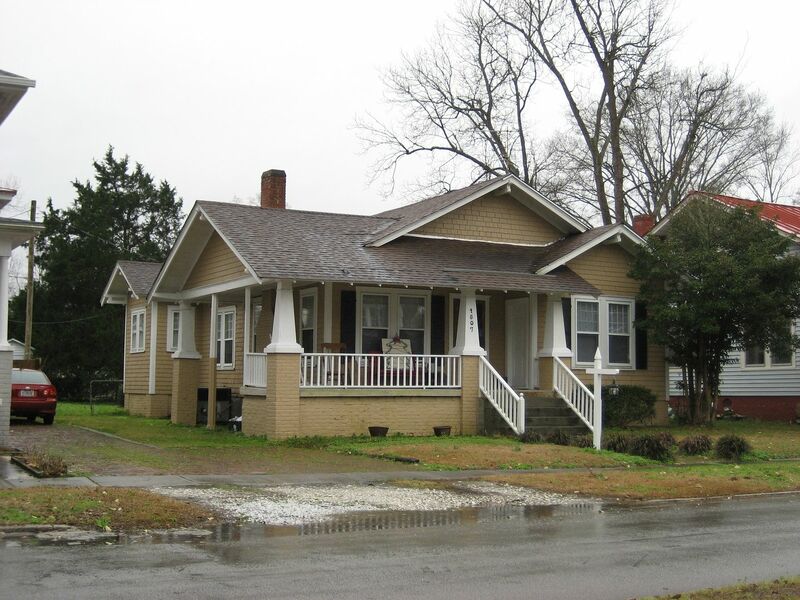 This blog on the New Martinsville Magnolia really is my 1000th post. 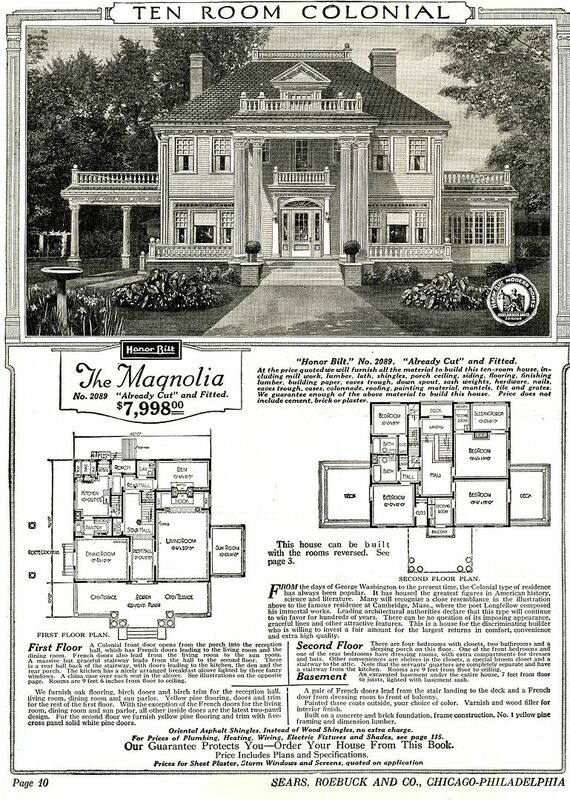 The Magnolia was offered in the Sears Modern Homes catalog from 1918 to 1922, and yet three of the Sears Magnolias I've encountered were built after 1922. 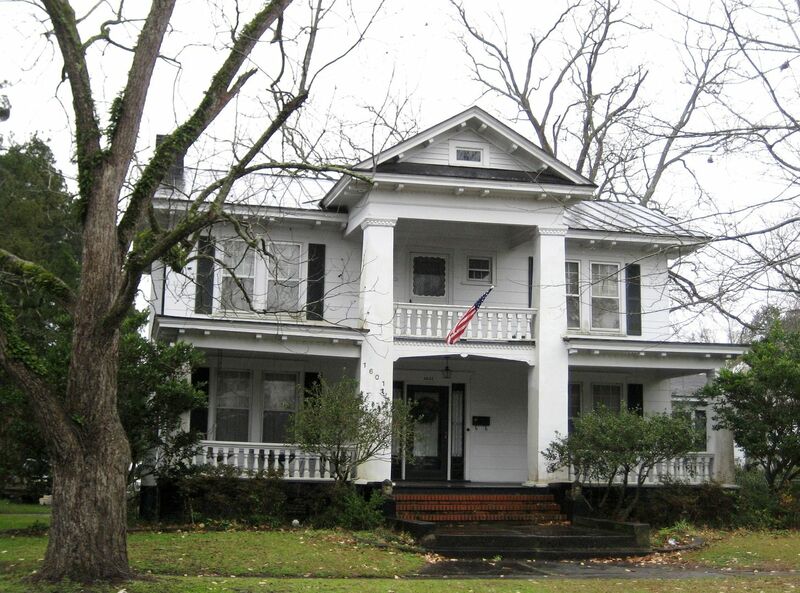 The house in New Martinsville was built after 1930. 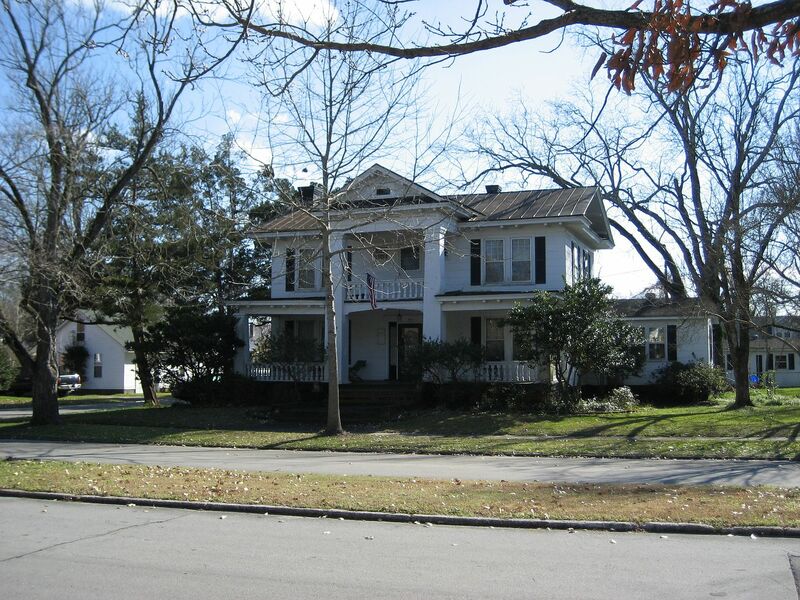 The Magnolia (as designed) was 36-feet deep and 40-feet wide. 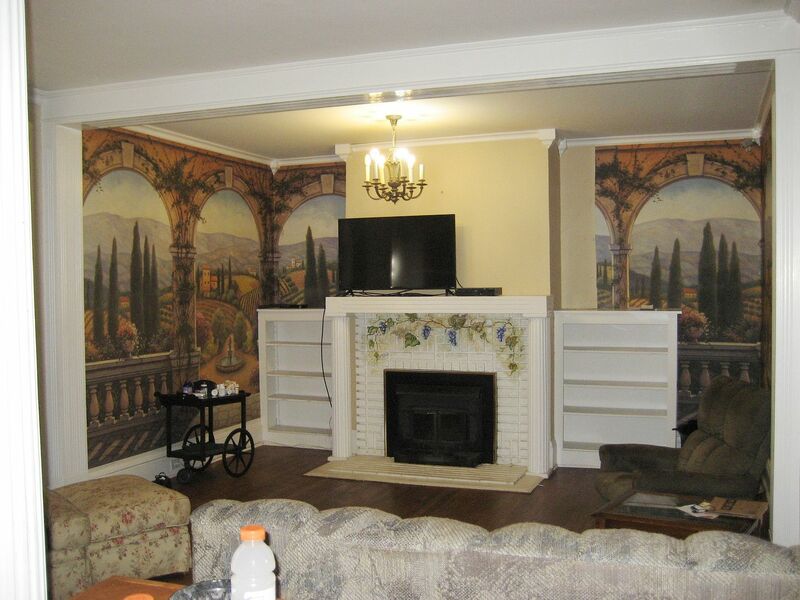 The house in New Martinsville is 40-feet deep and 44-feet wide. At first glance, it all looks swell. 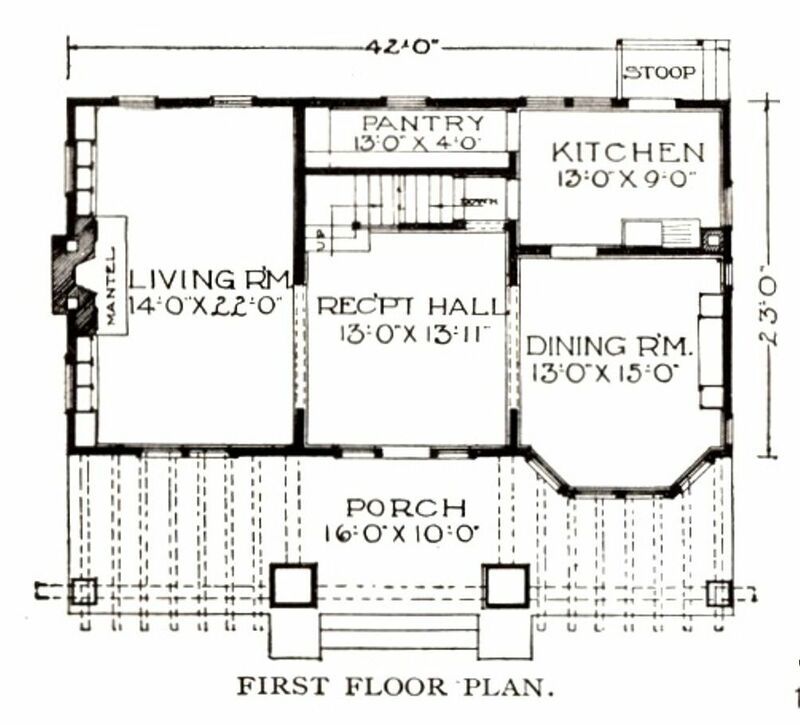 And while it doesn't have those little lites atop the first floor windows, it does have replacement windows and substitute sidings, and if I had been allowed to pull out the windows and take a good look, I suspect I'd find evidence that when built, it had the small transom lites over the windows. Comparing it to other Magnolias, it looks pretty good too. 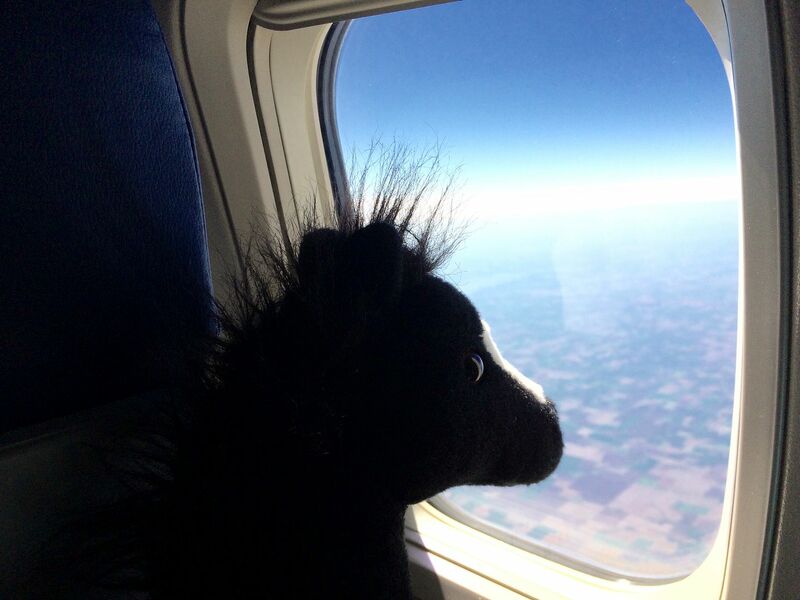 In fact, it looks real good! 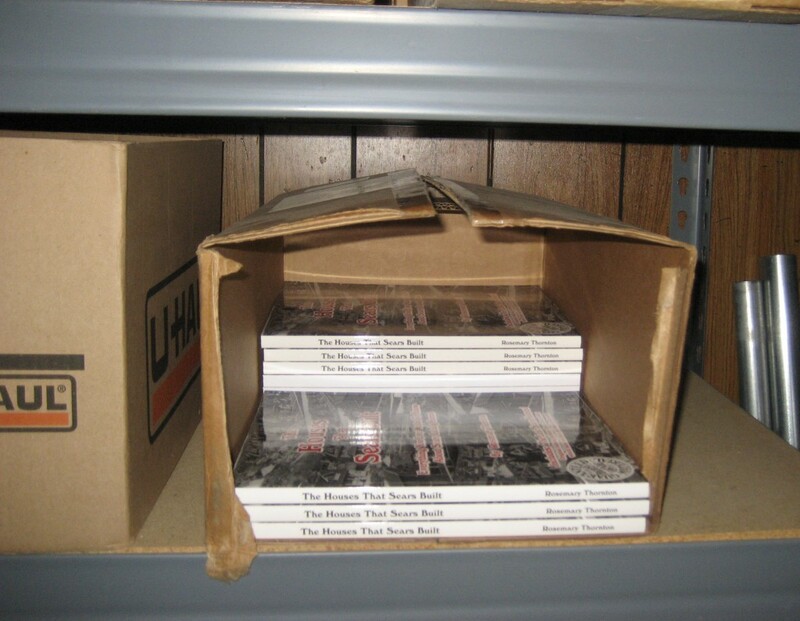 Inside, things look pretty good, too. 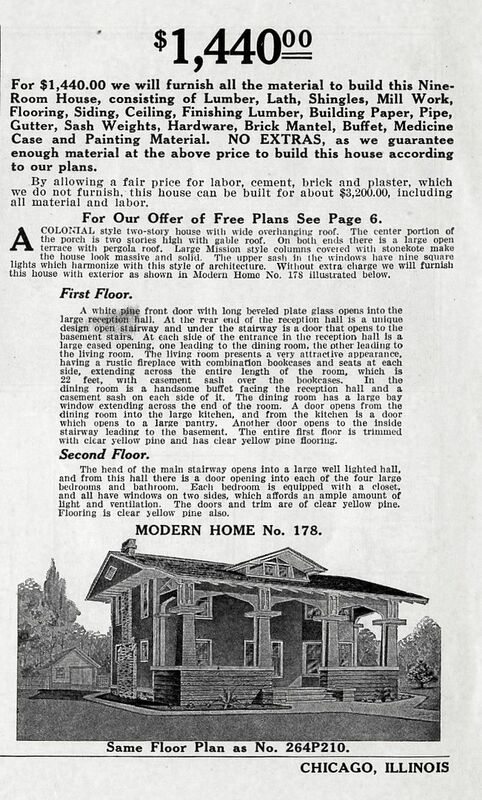 (Left to right: Catalog image 1918, Sears Magnolia in Nebraska, and the New Martinsville Magnolia.) 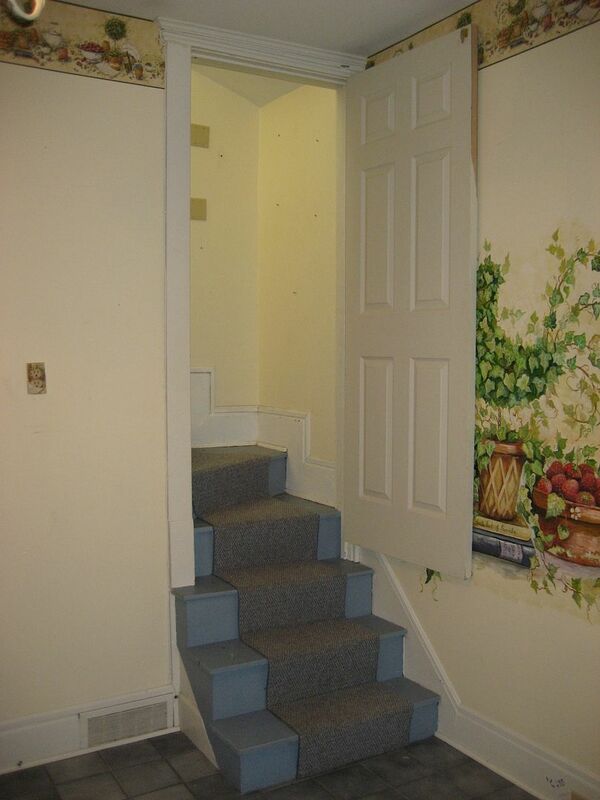 The only thing is, that flare at the bottom of the staircase is wrong. 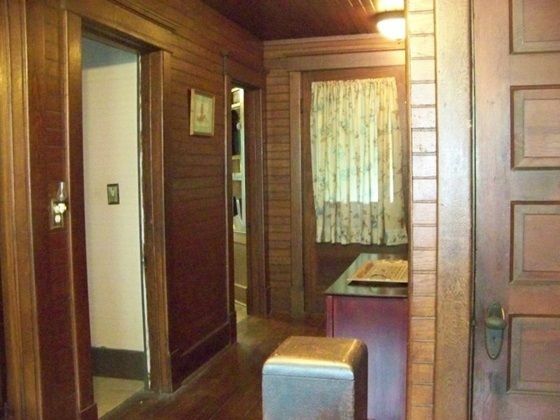 And the hallway is a little too wide. 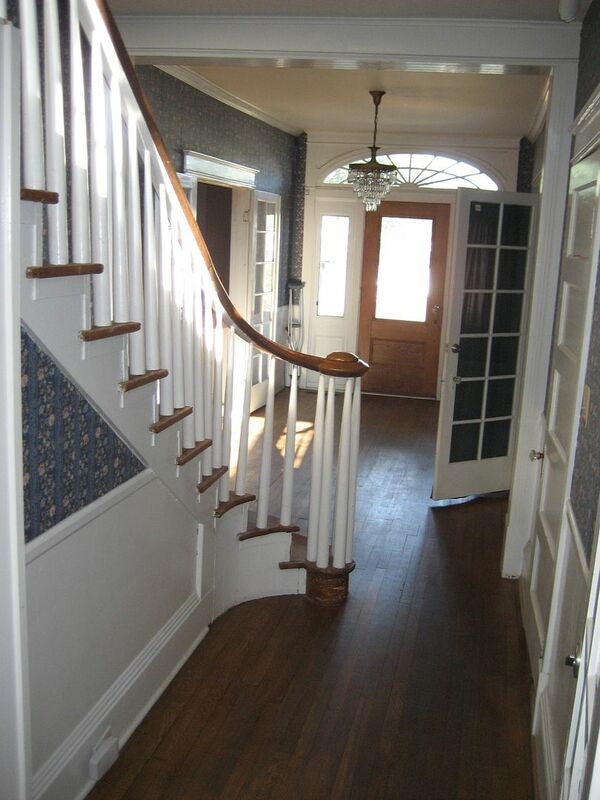 Those pilasters in the New Martinsville house are too close to the stairs. 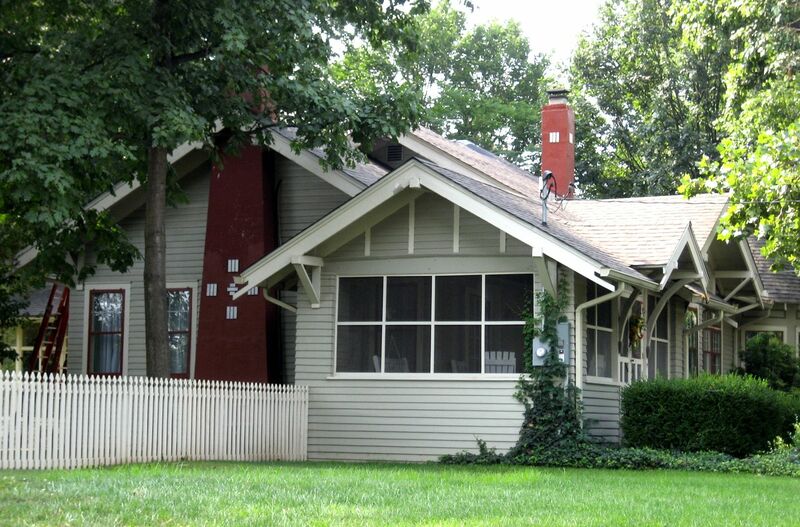 Photo is courtesy Nebraska State Historical Society and may not be used or reproduced without written permission. 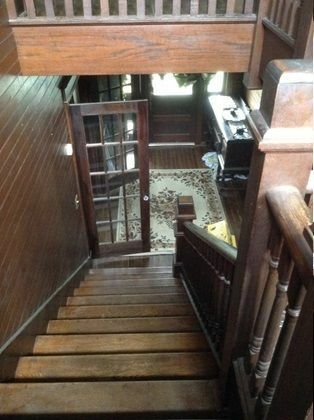 And yet when you go upstairs, things look good there, too. 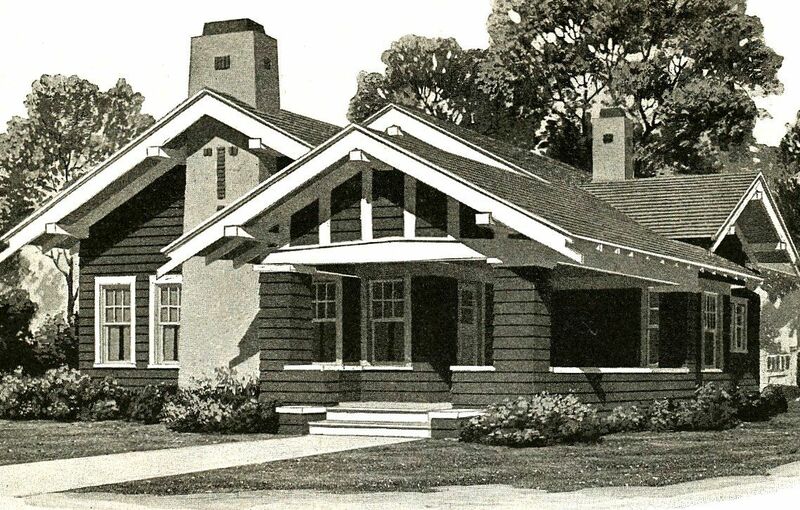 (House on right is the Magnolia in Nebraska.) Photo is courtesy Nebraska State Historical Society and may not be used or reproduced without written permission. 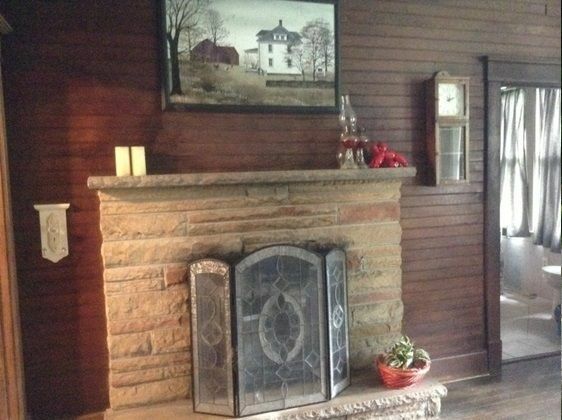 Looking toward the front door, it's a beautiful home, but is it a Magnolia? It sure is close. 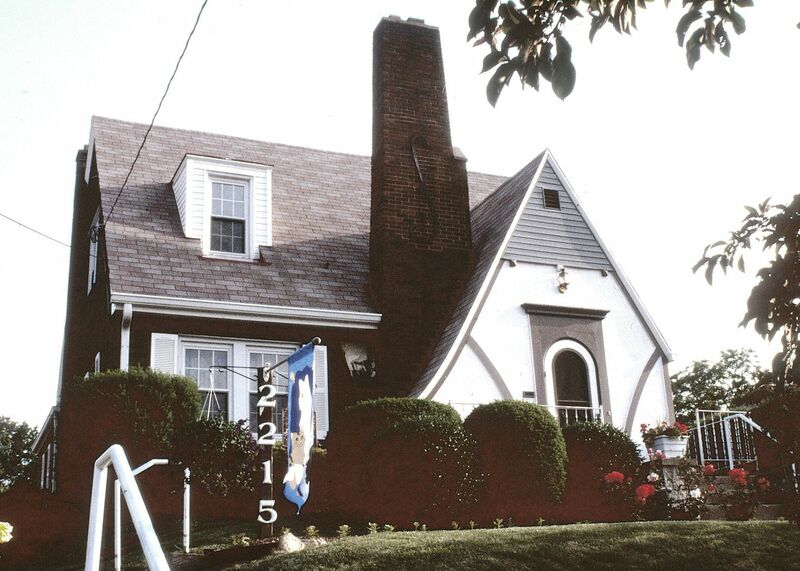 With a little help from my friends, we now know that Dr. Schmied and his wife Anna occupied the house, and may have been the home's original owners. 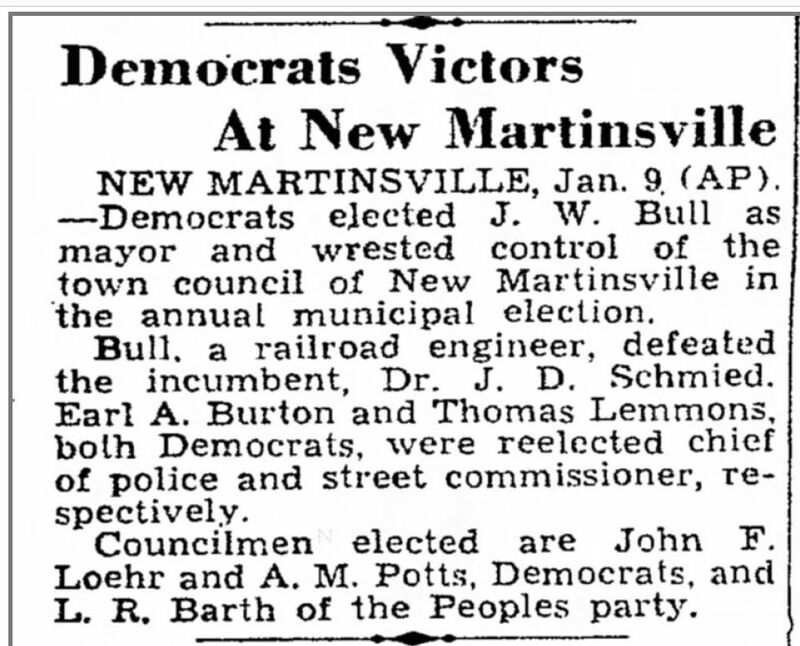 Dr. Schmied was the town mayor for a time, so he was definitely a man of some import. 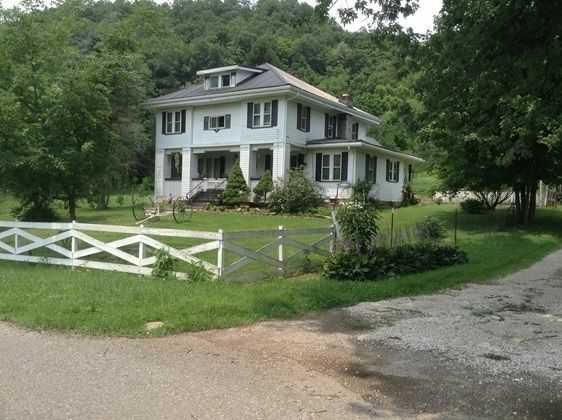 Given that New Martinsville is a small town, someone must know more about this house. 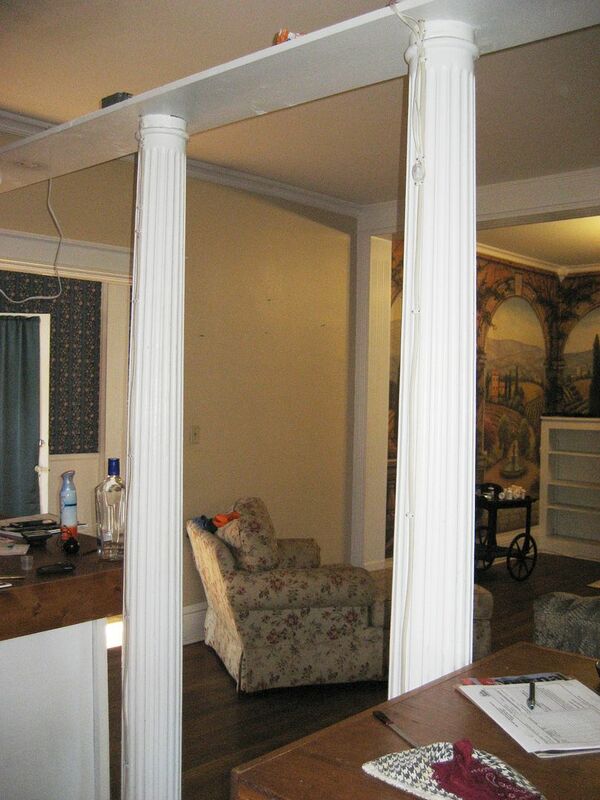 Then there's this: The millwork isn't right. 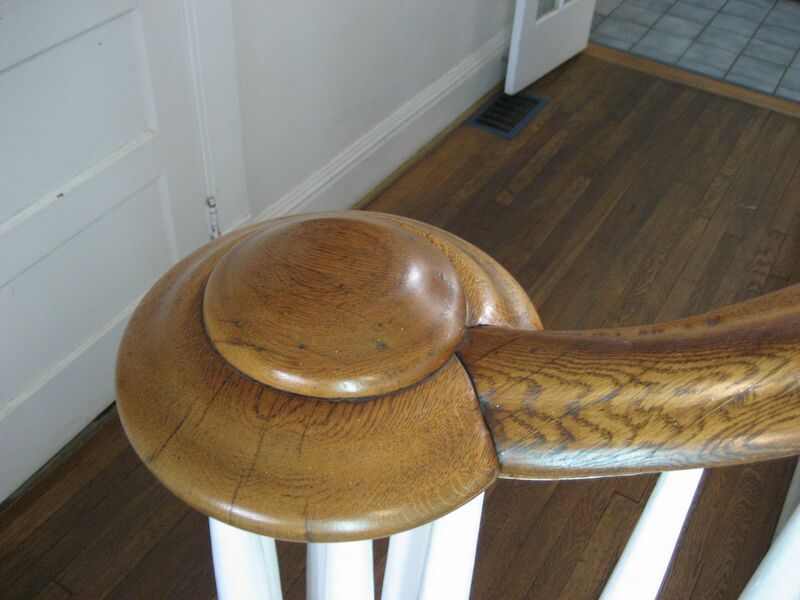 Sears didn't offer a volute like this at any time in their mill-work catalogs. 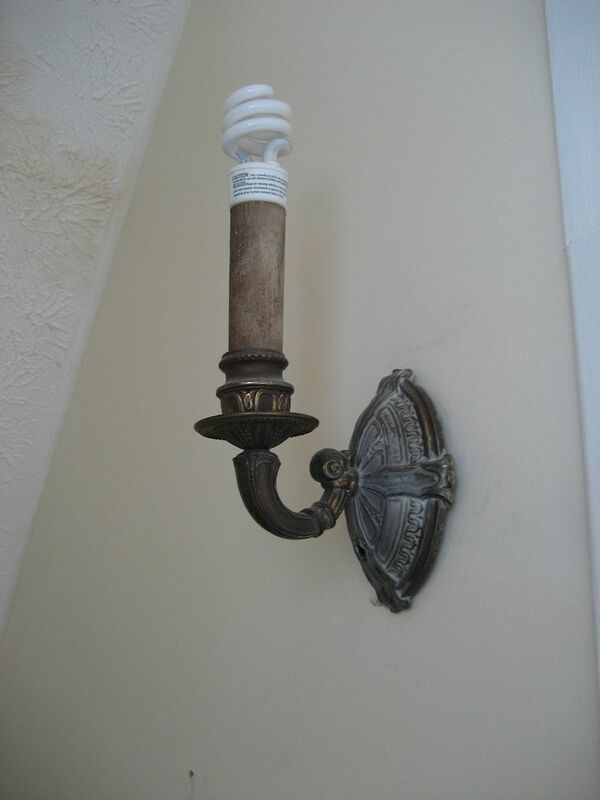 And I'm not sure if that's a "volute" or just a cap. But it doesn't appear to be anything Sears offered. 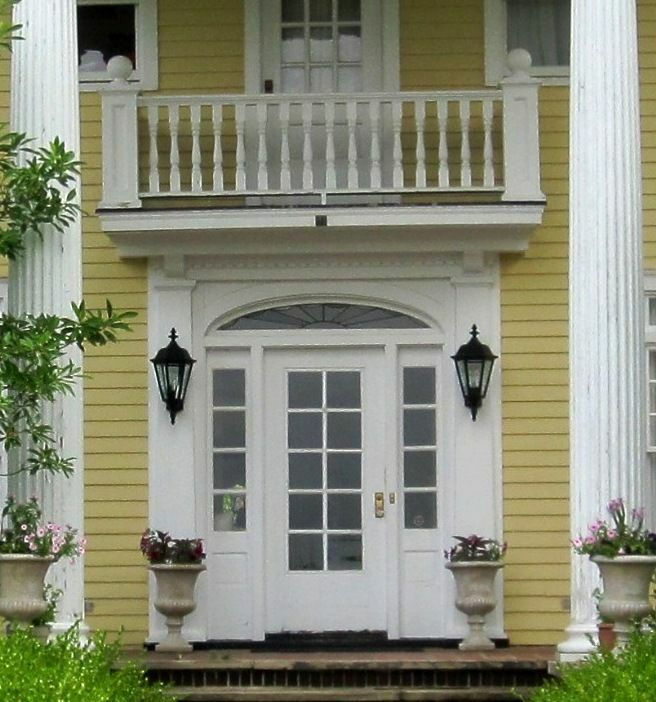 When I look at that balustrade, all I can think is that the cap looks like a Honey Bun. 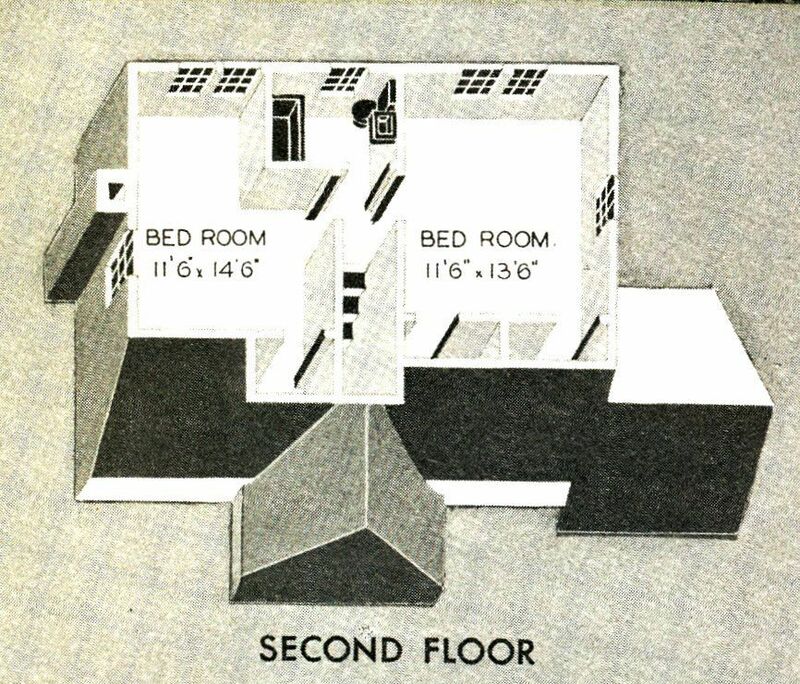 For the most part, the doors are in the right place and the floorplan is right. 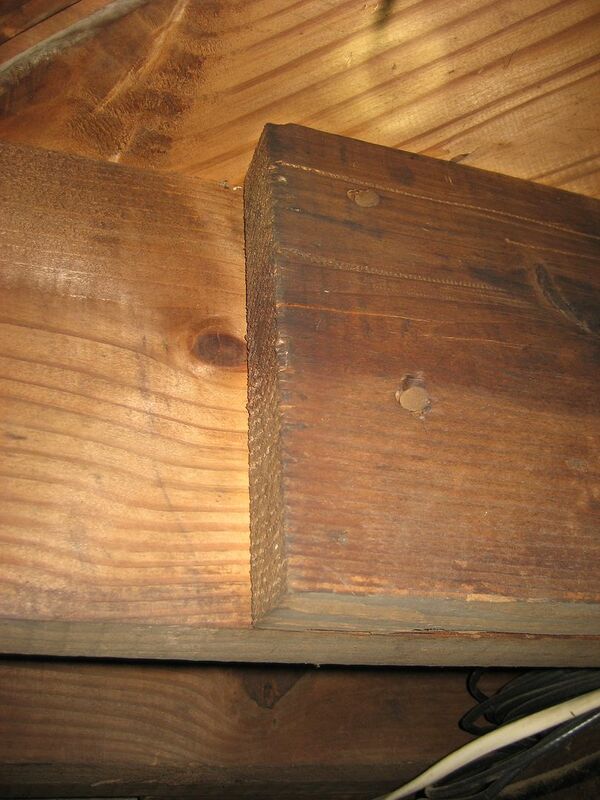 Then again, Sears didn't offer these tapered spindles (shown on the left) in their millwork catalog. 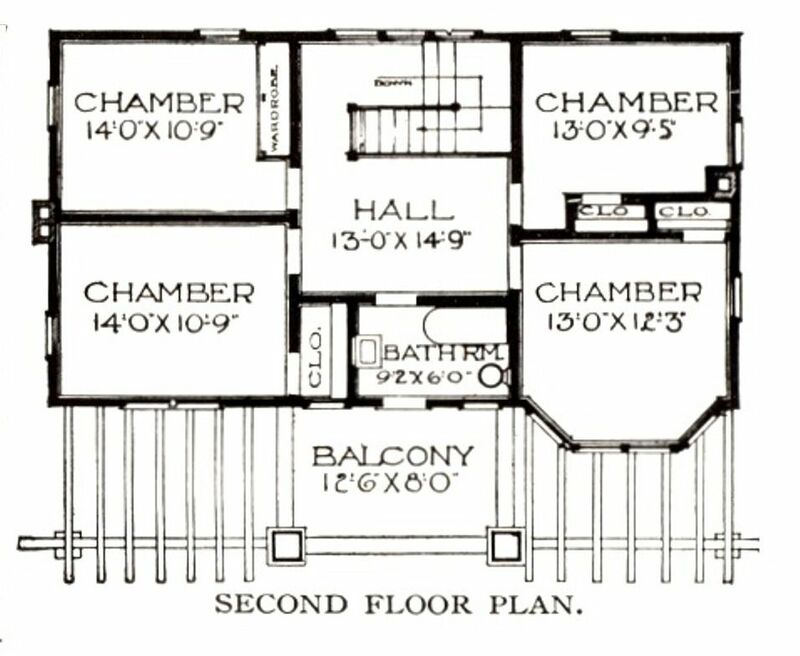 And that funny little rear staircase - descending into the kitchen from the servant's quarters - is right where it should be. 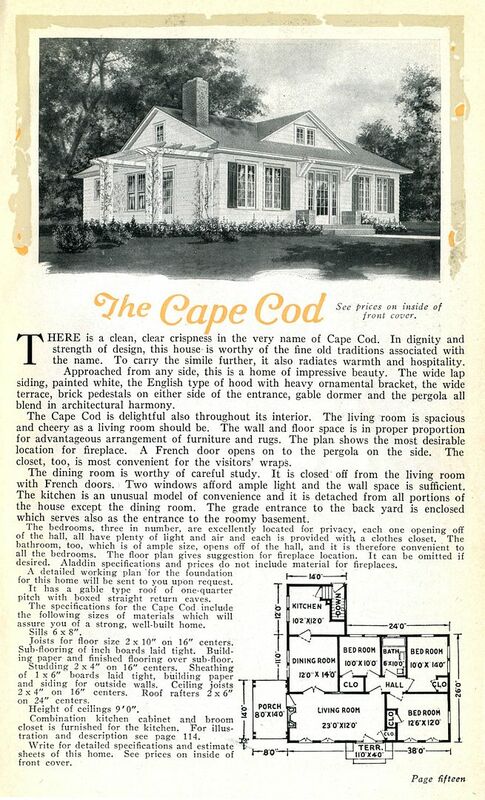 This 1930s home had several original light fixtures, but I couldn't find them in the catalogs, either. But then there's this. 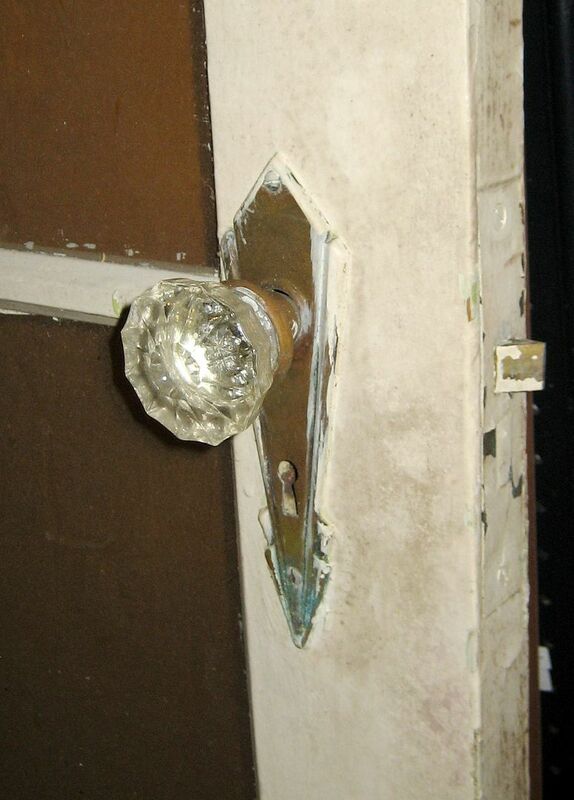 This style knob and escutcheon was found throughout the Magnolia, and it was a model offered by Sears. 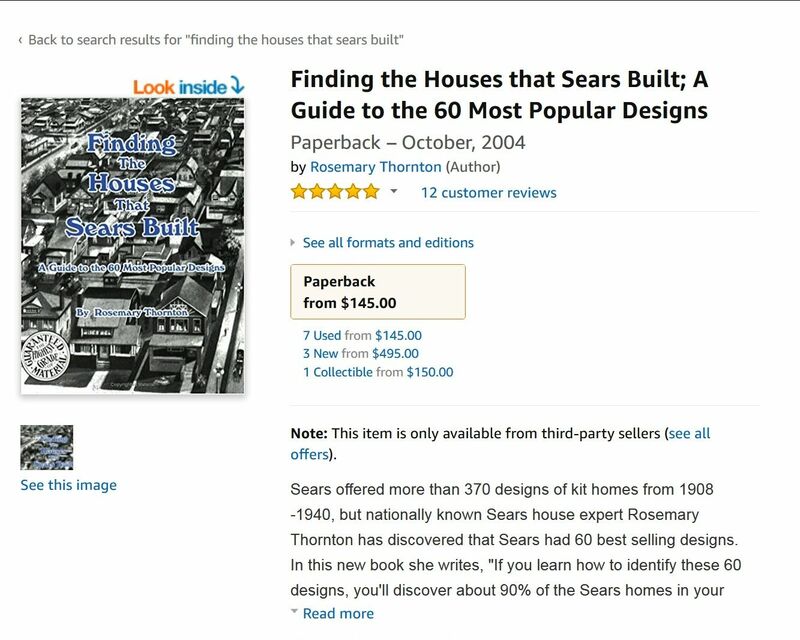 Does Sears hardware make it a Sears House? It certainly does add to the intrigue. 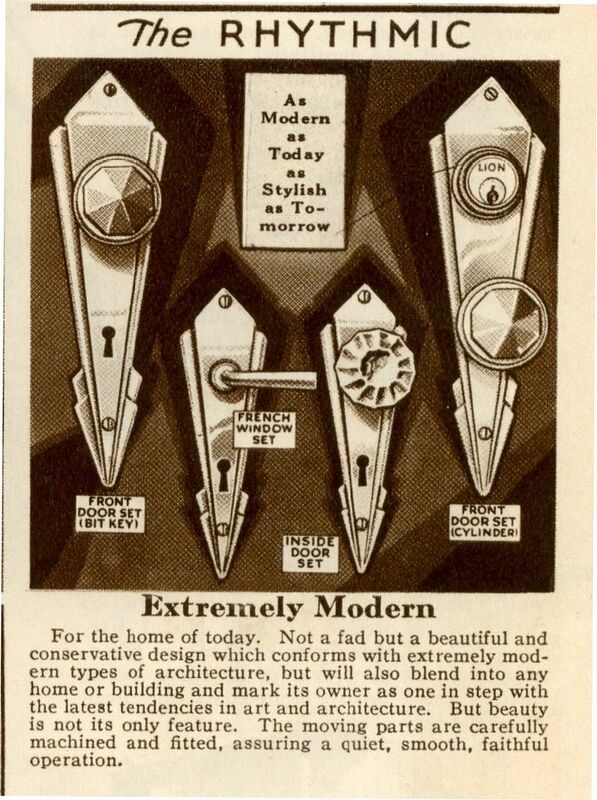 Rhythmic door hardware was first offered in 1930, in the Sears Modern Homes catalog. And it's fairly unique. 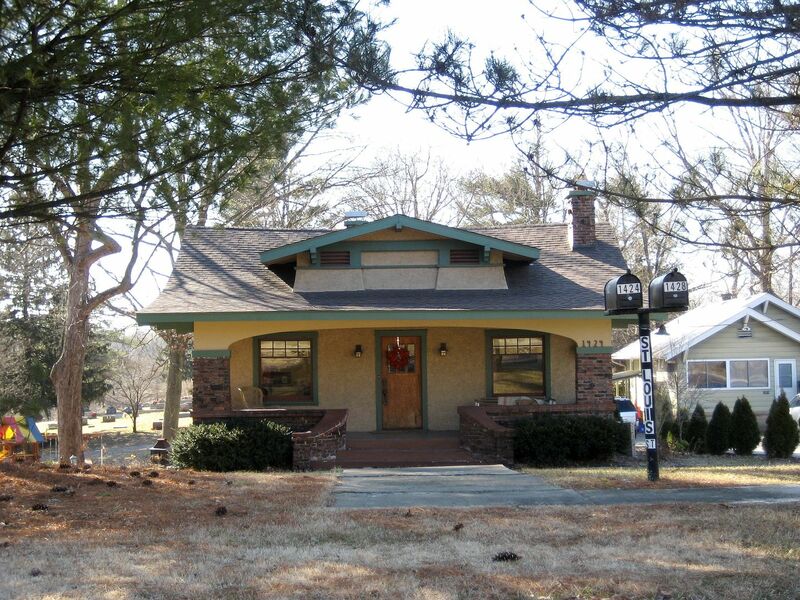 And it's "not a fad," but it is Art Deco. What's not to love! 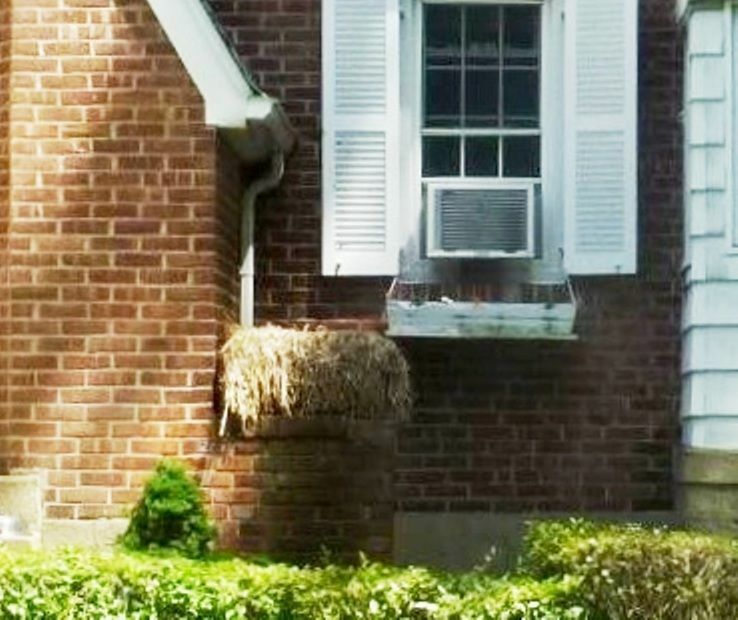 It blends into any home or building! And then there's this, too. 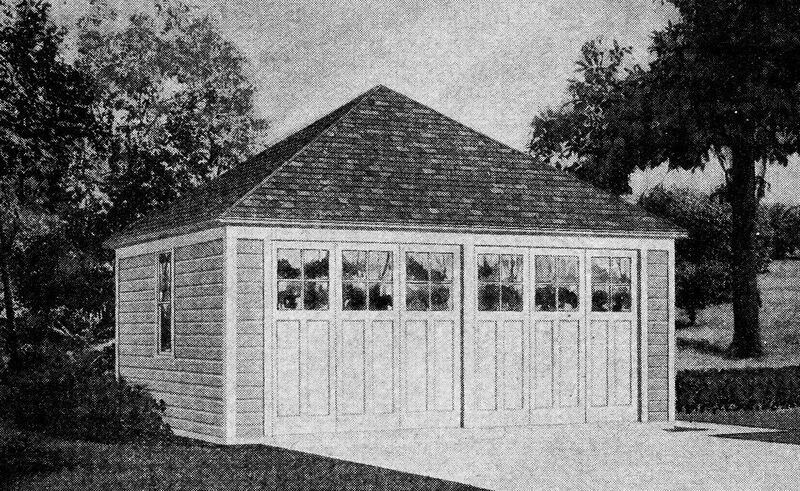 The garage (as shown in the 1938 catalog). The garage is a darn fine match. 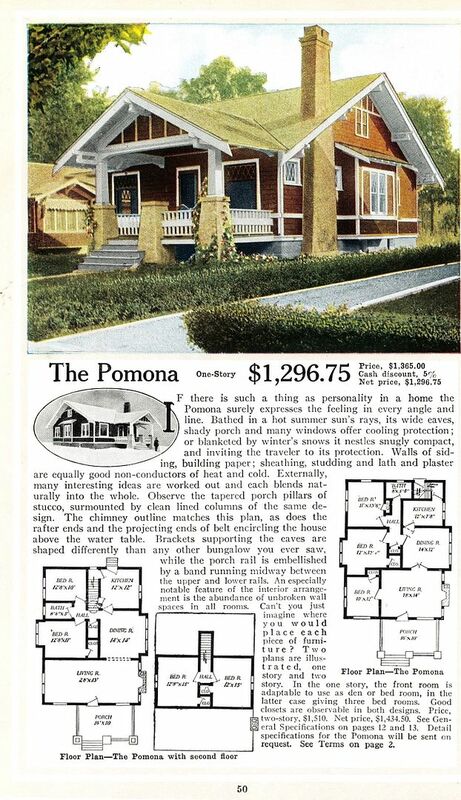 The front extends well past the garage shown in the catalog image, but that could have been altered easily enough when built, or in the intervening 90 years. 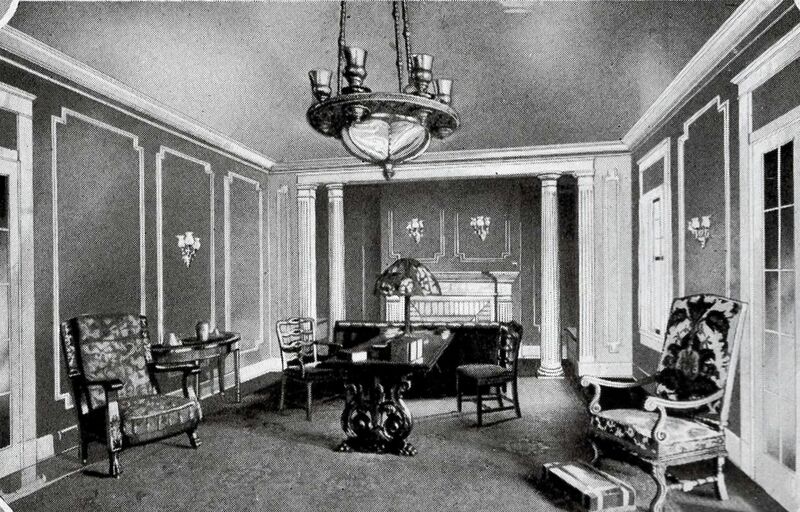 This is the living room as shown in the 1918 catalog. 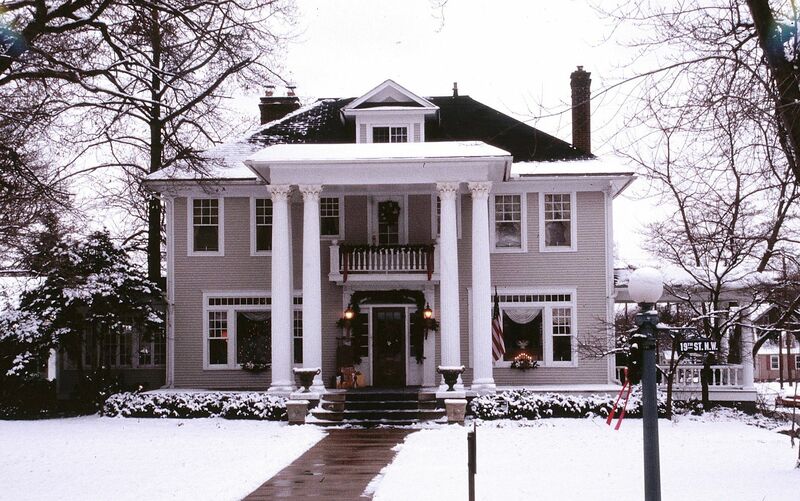 The Magnolia in Nebraska was still largely original when it was destroyed. 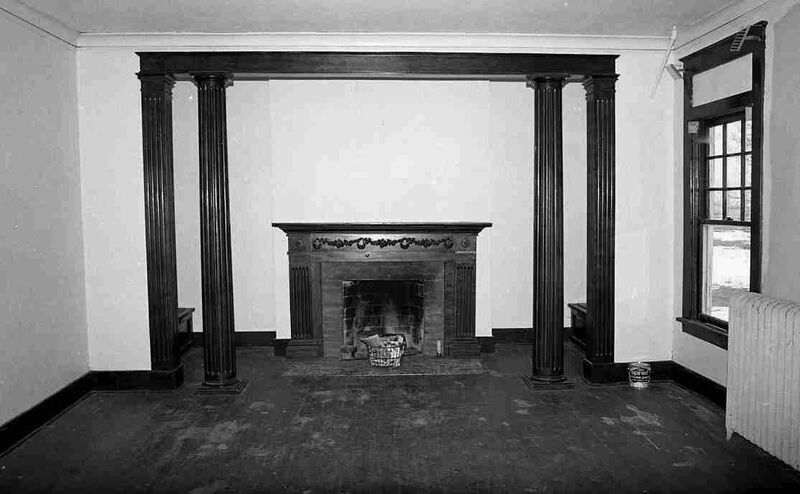 The inglenook is still intact. Photo is courtesy Nebraska State Historical Society and may not be used or reproduced without written permission. 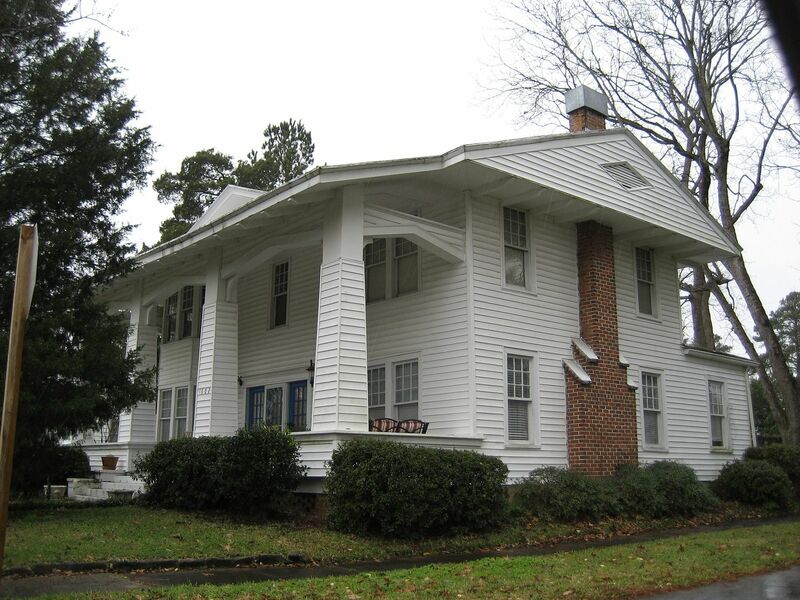 The New Martinsville house was used for a time as a restaurant, so it's been dramatically altered, and yet those pilasters (edge of photo) are still in place. 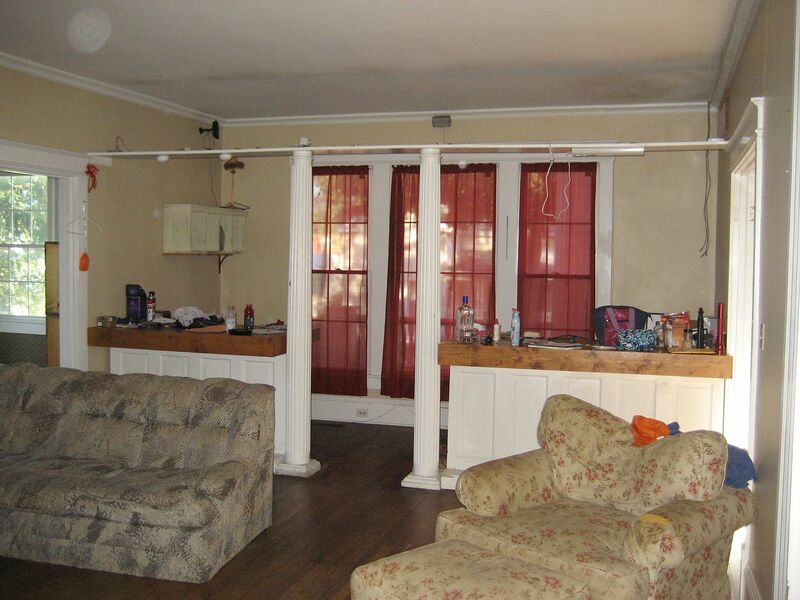 But the columns were moved to the back of the living room (near the front of the house). 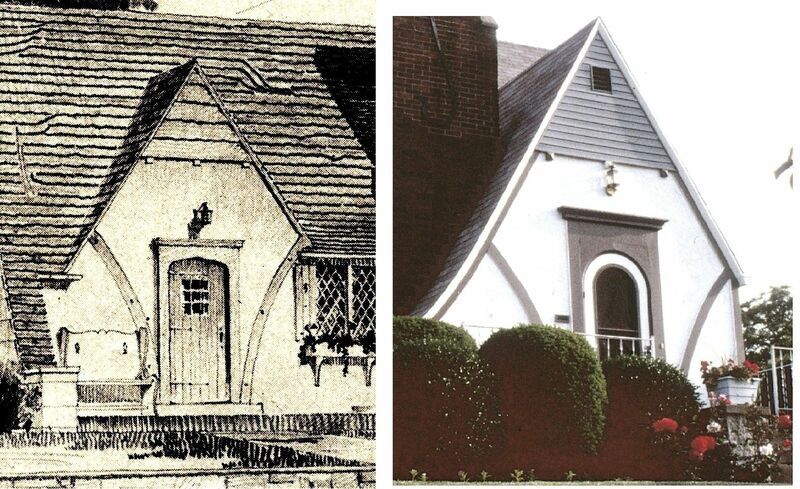 Most likely, these alterations occurred when the house was used as a business (restaurant and retail sales). 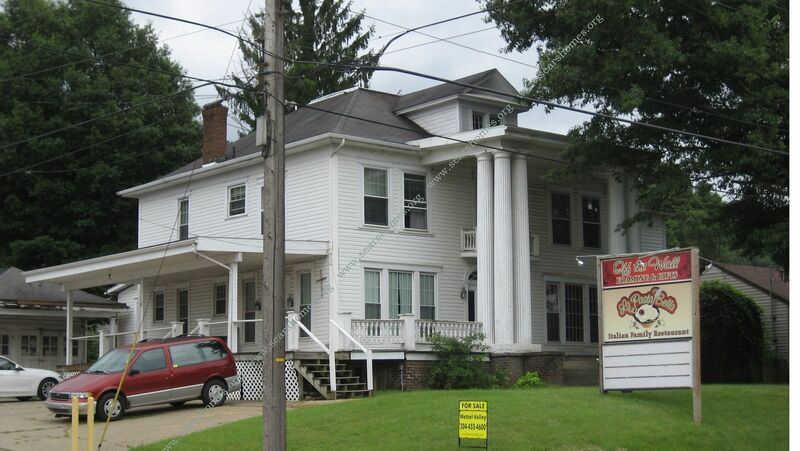 Those three windows (covered in red drapes) are on the right front as you face the house. 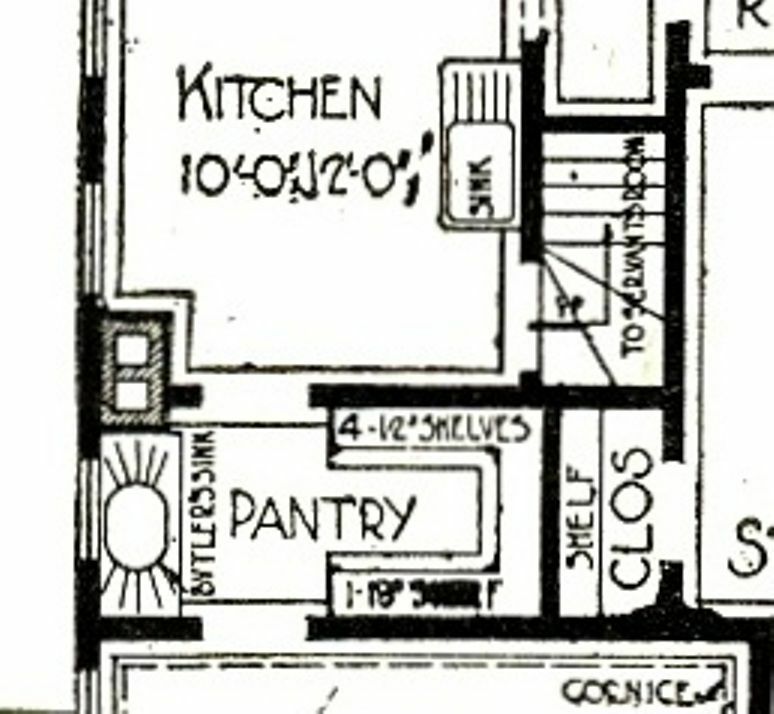 And the Butler's Pantry is in the right place, too, between the dining room and kitchen. 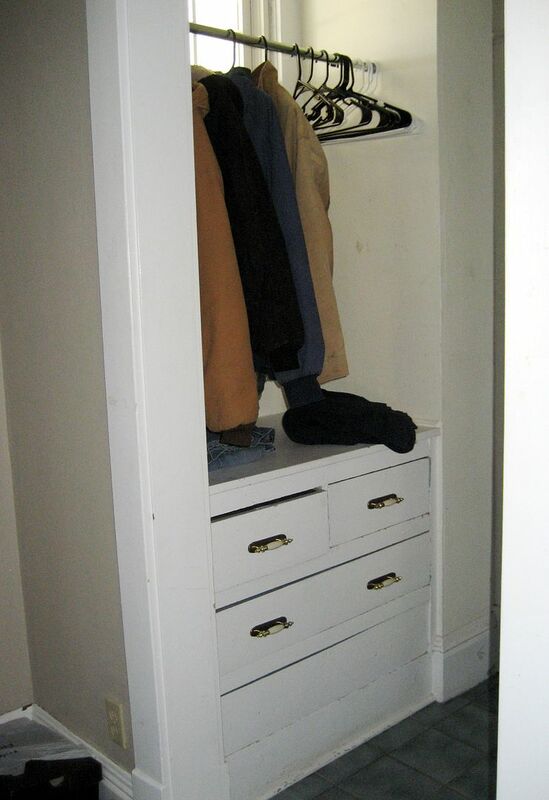 It is (as my friend James said), "a butler's pantry for anorexics." It's pretty darn small. 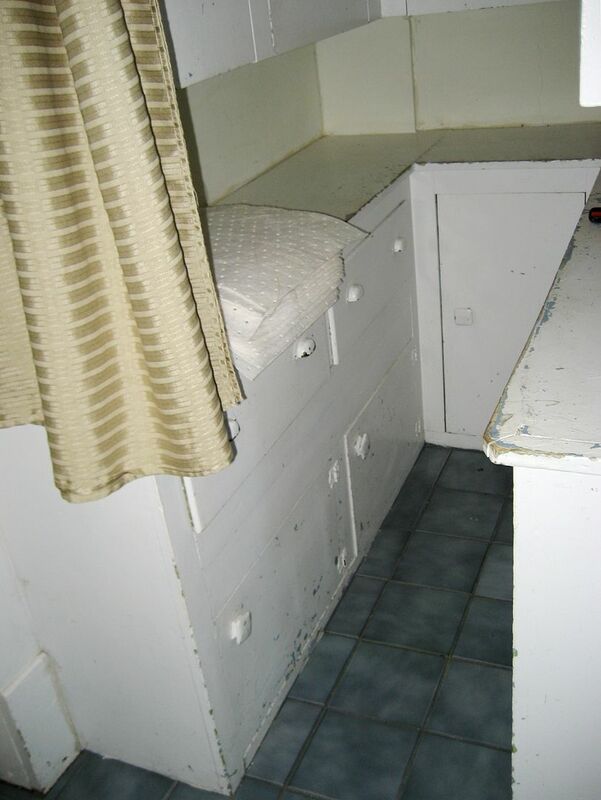 On this side, there should be a sink, but it's MIA. 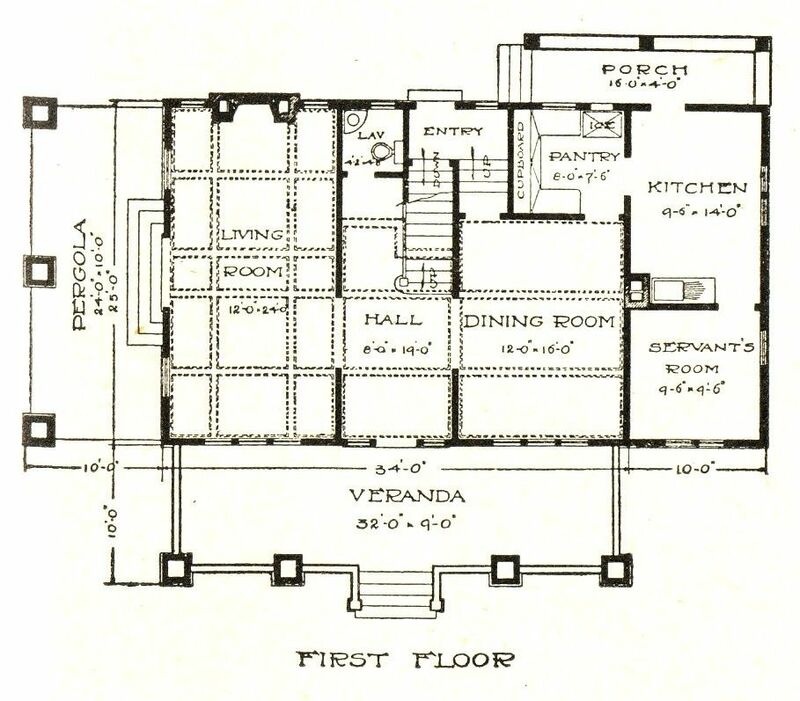 As seen in the 1920 Sears Modern Homes catalog - the first floor. 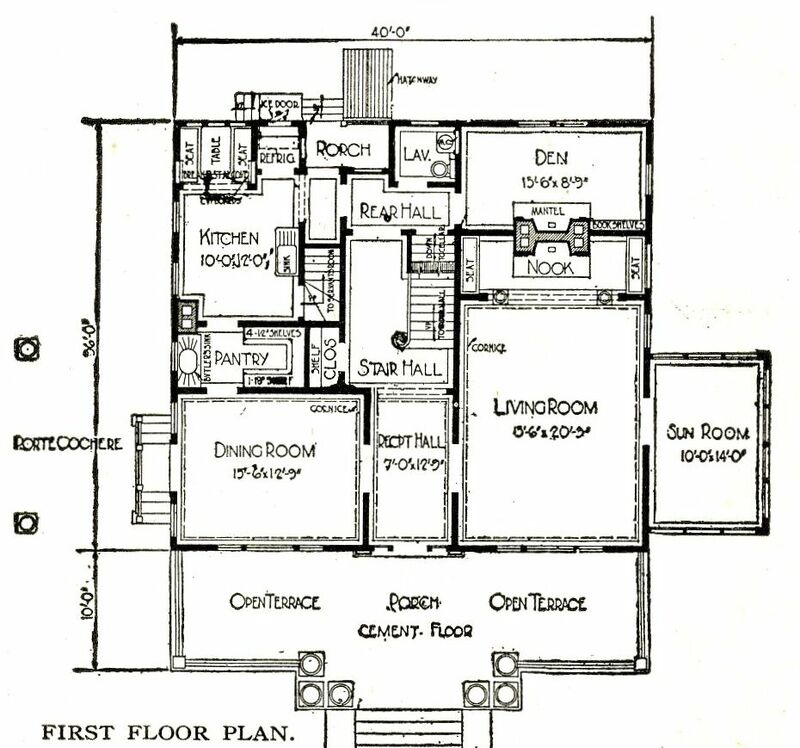 Having seen the inside of several Magnolias, as well as this house in New Martinsville, I must say that it's a fairly good match to this unusual floor plan. 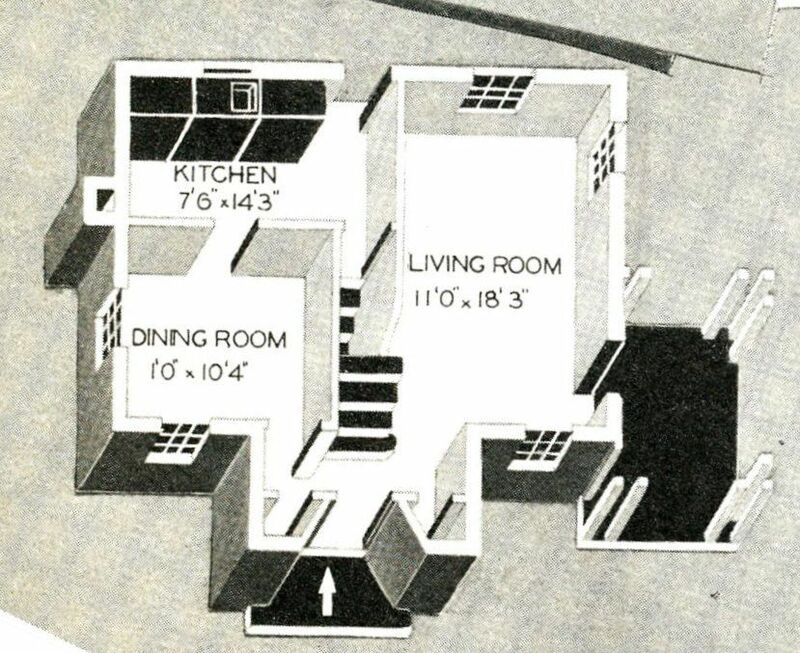 And that tiny Butler's Pantry is right where it should be, between the dining room and kitchen. 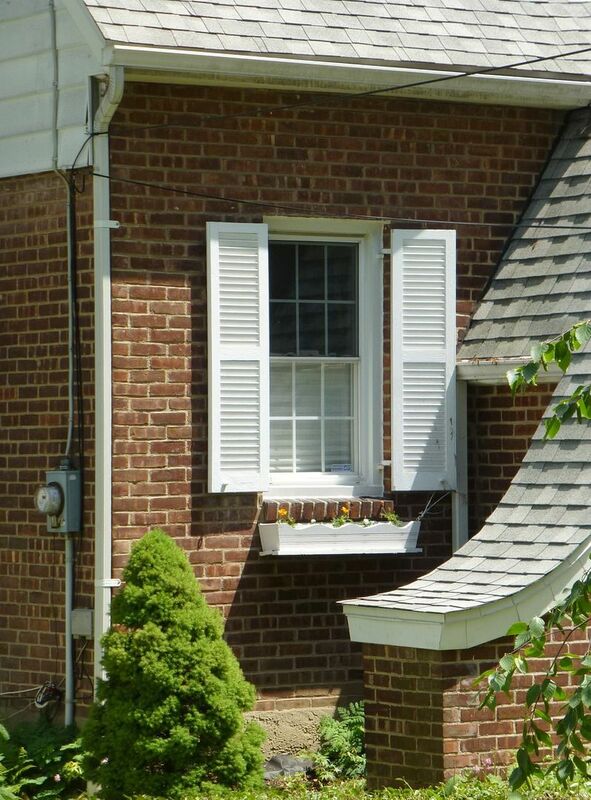 You can also see the servants stairs on this close-up. 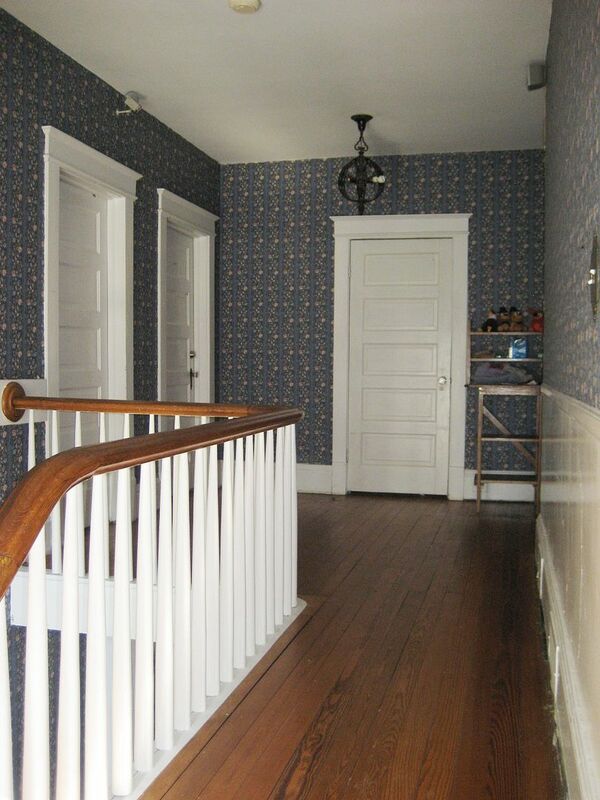 These stairs lead to the servant's bedroom above. 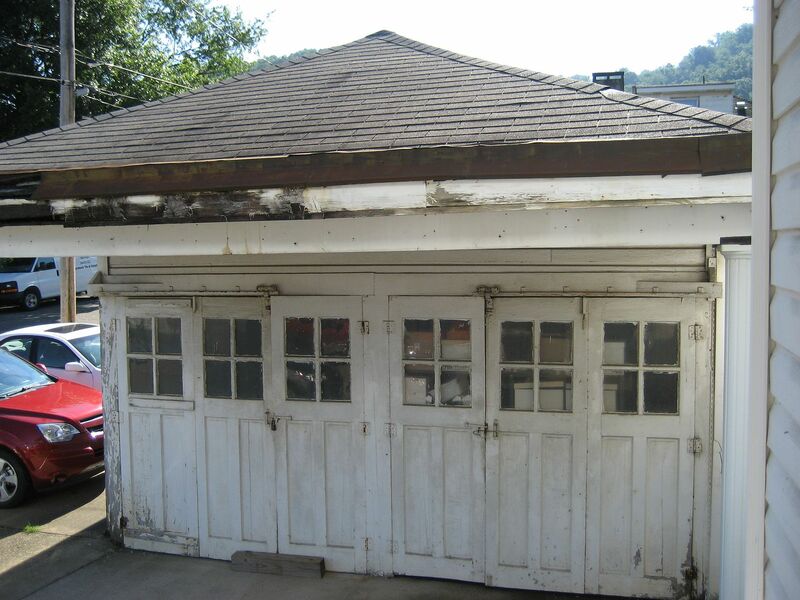 I spent way too much time in that basement, and yet saw no evidence of any marked lumber, blue grease pencil markings or shipping labels. 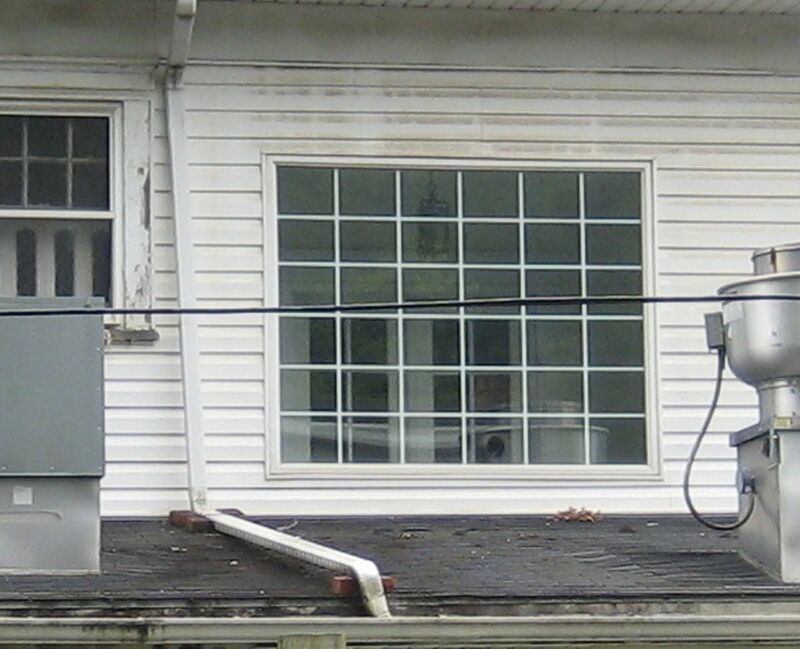 The back of the house is also a good match. 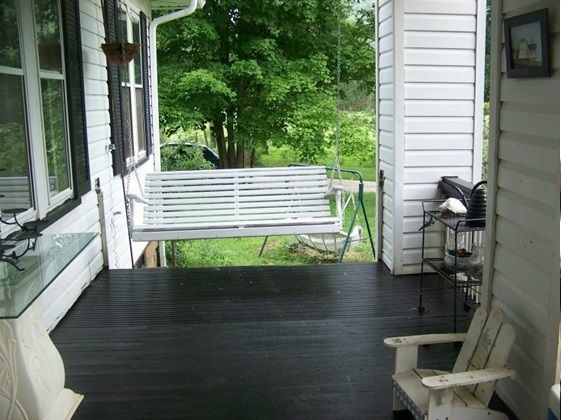 As designed, this was an open porch. 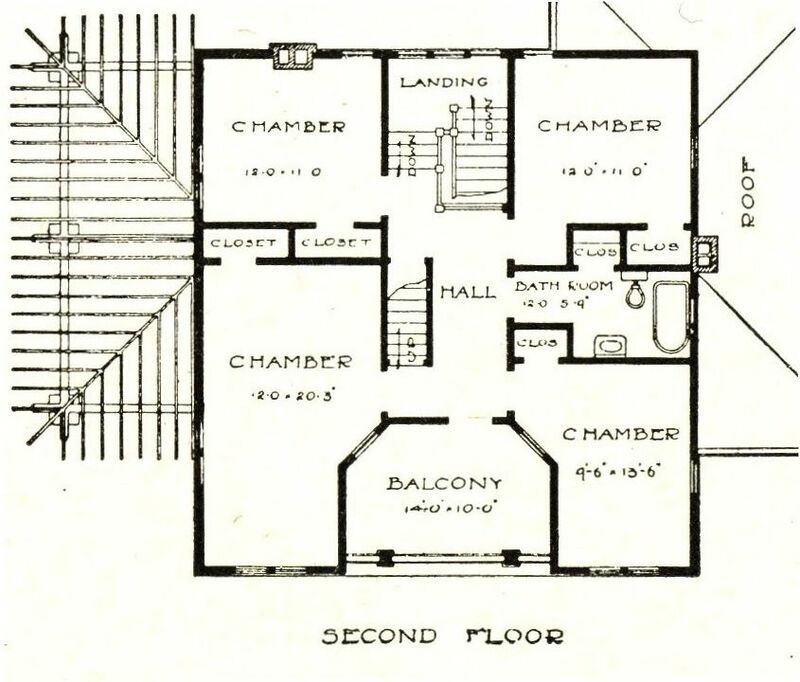 It's now enclosed, and you can see the French Doors leading to the servant's quarters (as per the original plan). 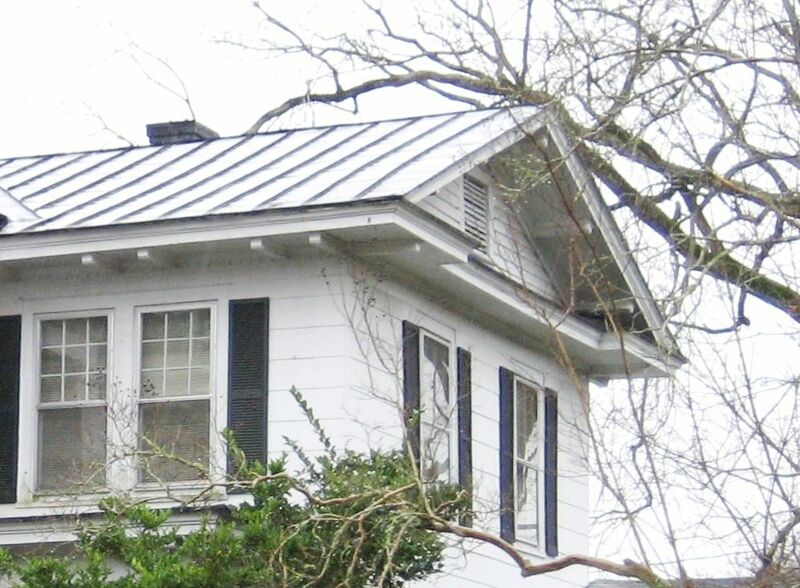 The house has been covered in substitute siding, so many architectural details - as to what was altered - are not visible. My pretty Magnolia, who has passed through your doors? Maybe they know your story! It's a beauty, but is it a Magnolia? 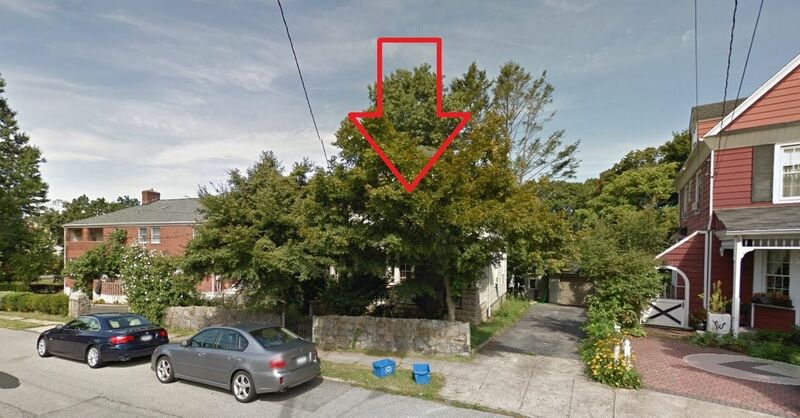 As I said above, I think it's probably a Magnolia, built with local lumber and perhaps even millwork. 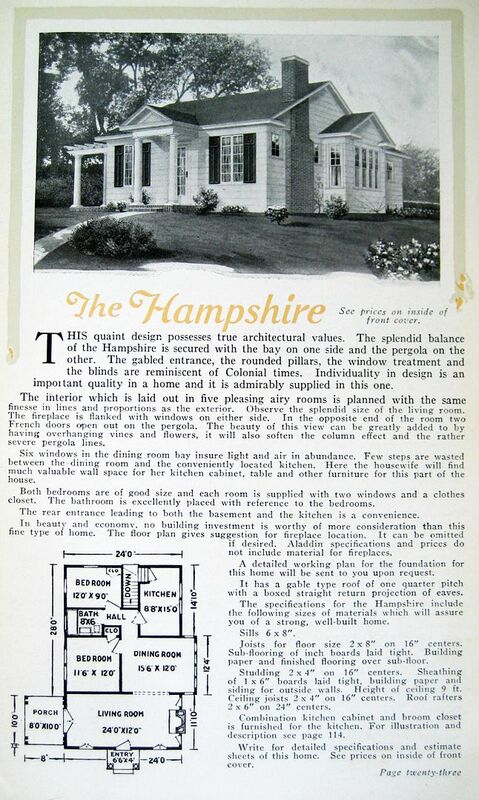 There's so much that's right about the house, but also, there's much that is not a good match. 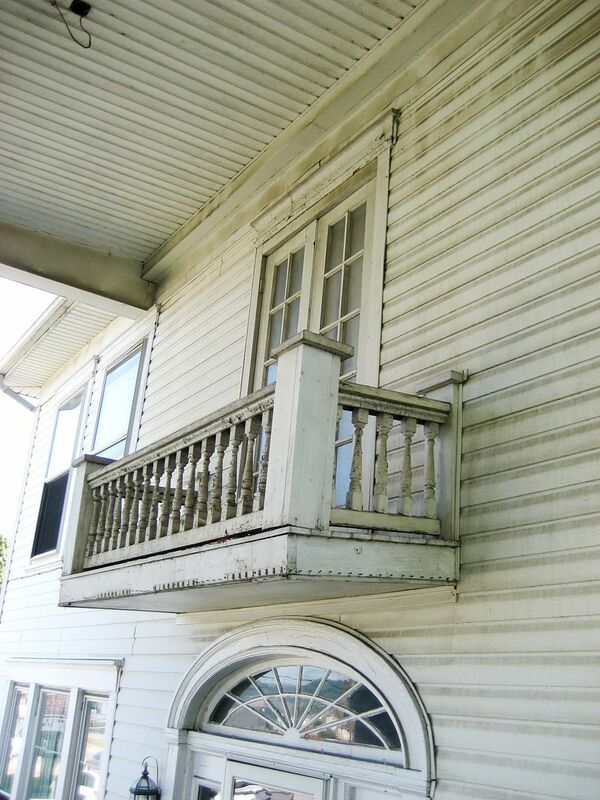 The "Juliet Porch" on the 2nd floor has a bit of a sag, but another Magnolia owner told me that their porch also needed a little bolstering. 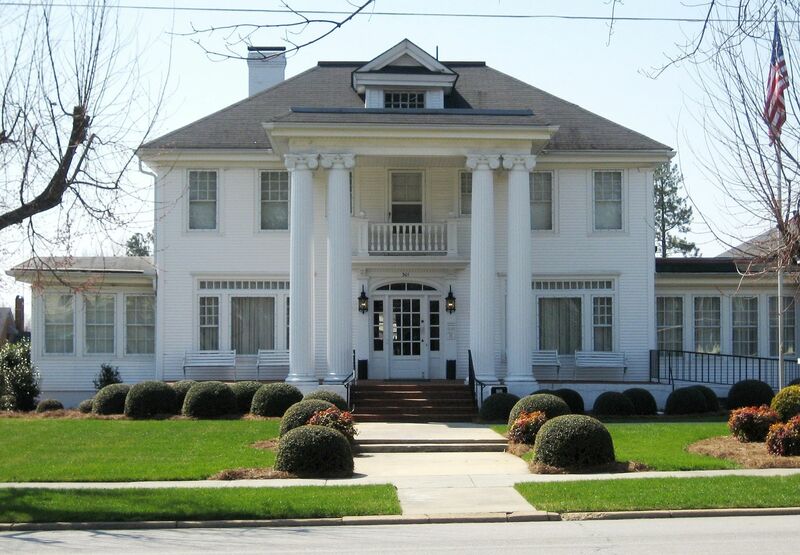 The spindles are right but it should have paneled columns at the corners. Was this rebuilt in later years? Also, the traditional Magnolia trim around the front door is missing. 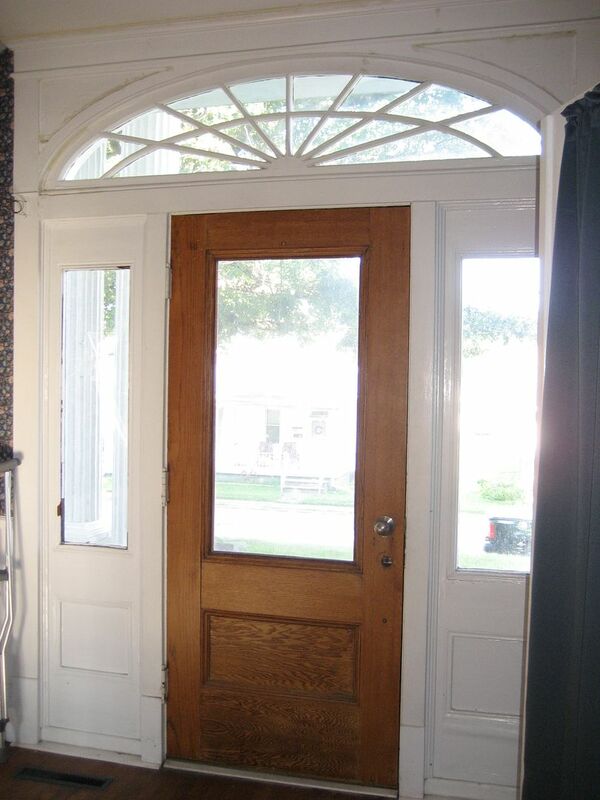 The trim around the Magnolia's front door should look like this. This Magnolia is also in West Virginia. To see what makes Rose laugh out loud, click here. Strathmore + Willard = Strathard? 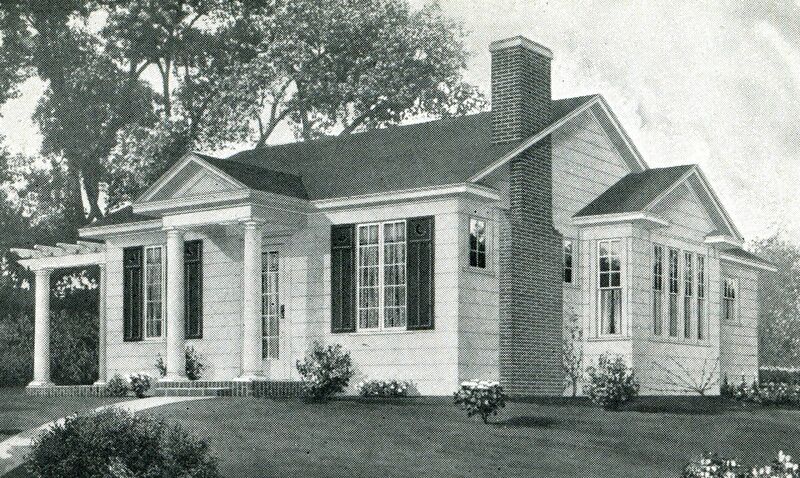 The Strathmore has always been one of my favorite models of Sears Homes. 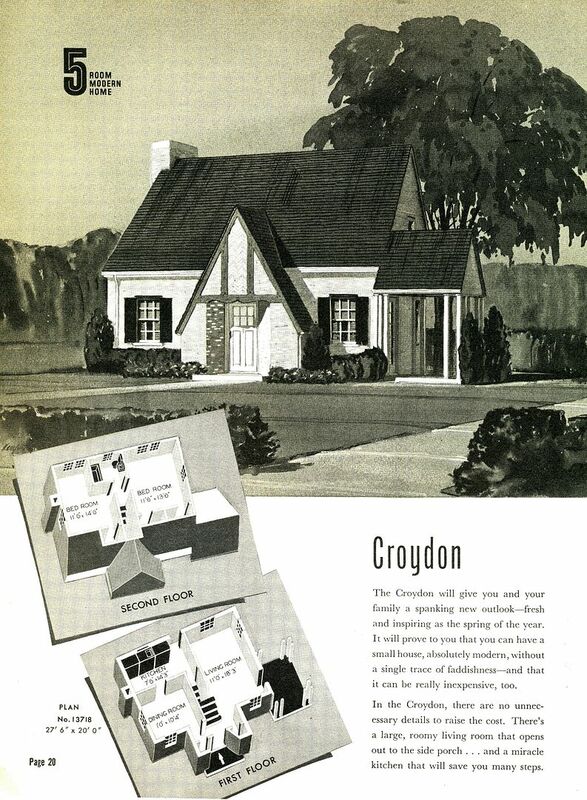 Then again, I'm a real sap for Tudoresque designs, and these Sears Tudors are utterly adorable (1936 catalog). 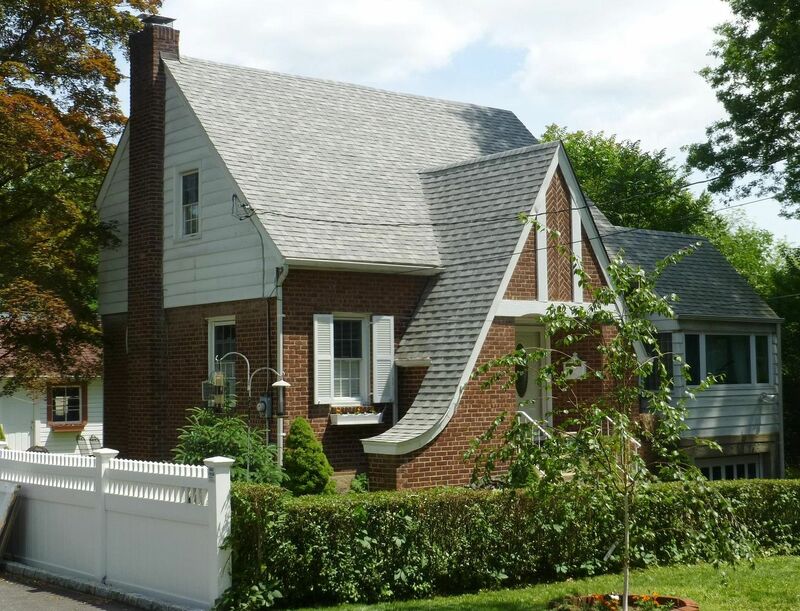 Seems like a very practical house, too. 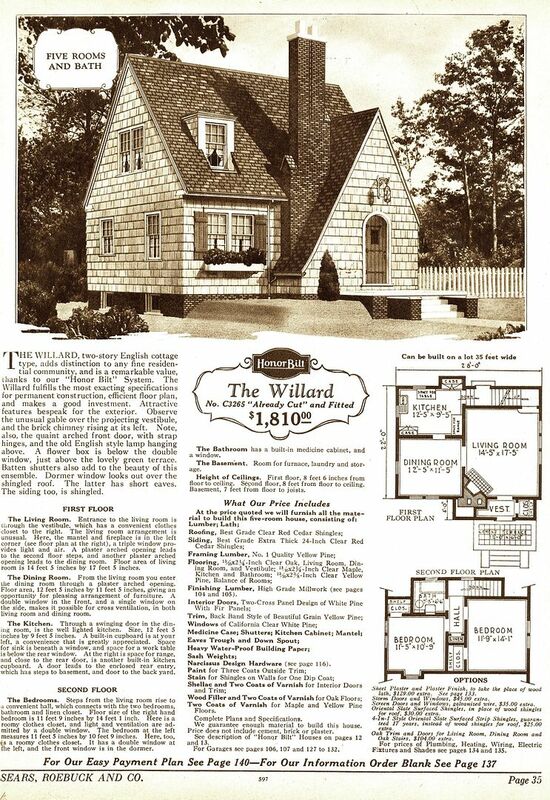 The Willard is another Sears neo-tudor that's also a darling little house. 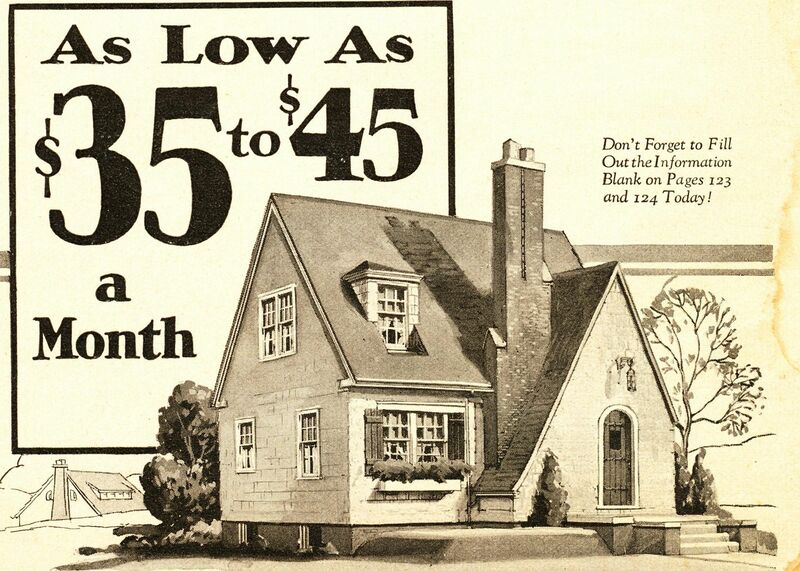 It must have been a big seller for Sears, too. 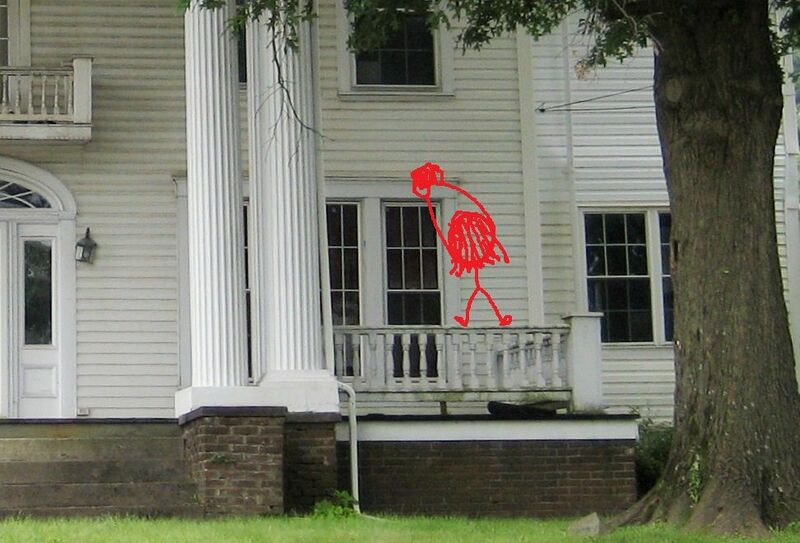 I've found Willards throughout the country, including unusual spots like Norfolk, Virginia and Tallahassee, Alabama! 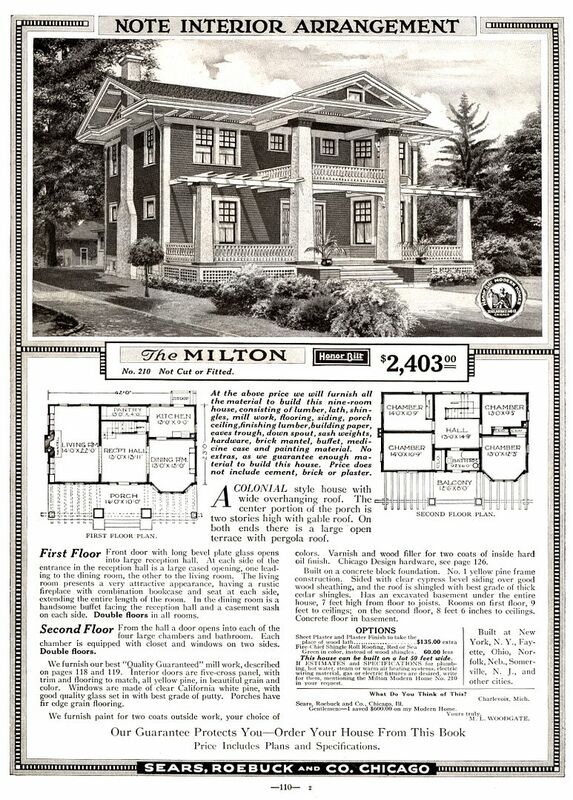 And the Willard was featured in this advertisement, promoting the low cost of owning a Sears House. Apparently, sometime ago in Norwood Ohio, someone couldn't decide between the Willard and the Strathmore. So they built this. 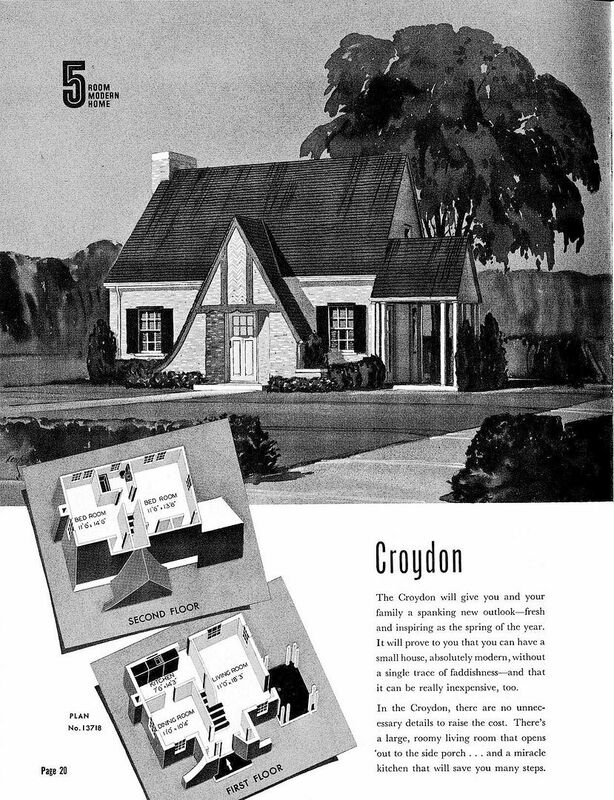 It's a Sears Willard, with the Strathmore foyer. 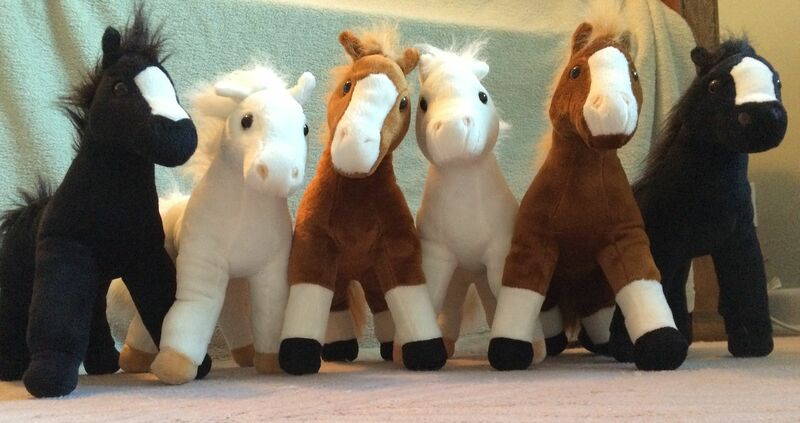 Pretty cute, isn't it? Nice match - at least on the front porch! 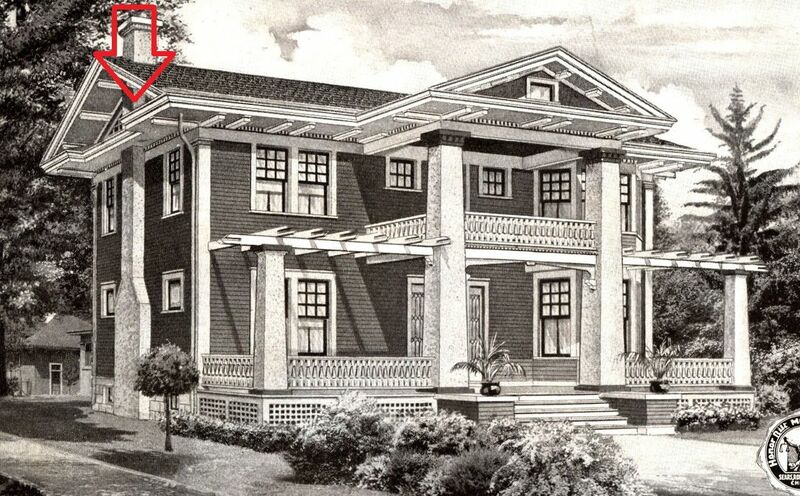 If you know the precise address of this house, please send it along. 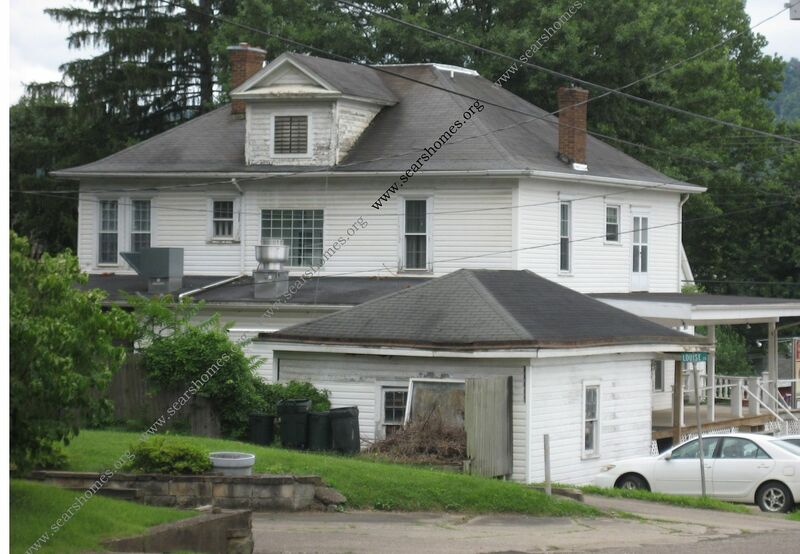 It’s in Norwood, Ohio and the street number is 2215 (visible in the photos above). All I need now is the street’s name! Update! 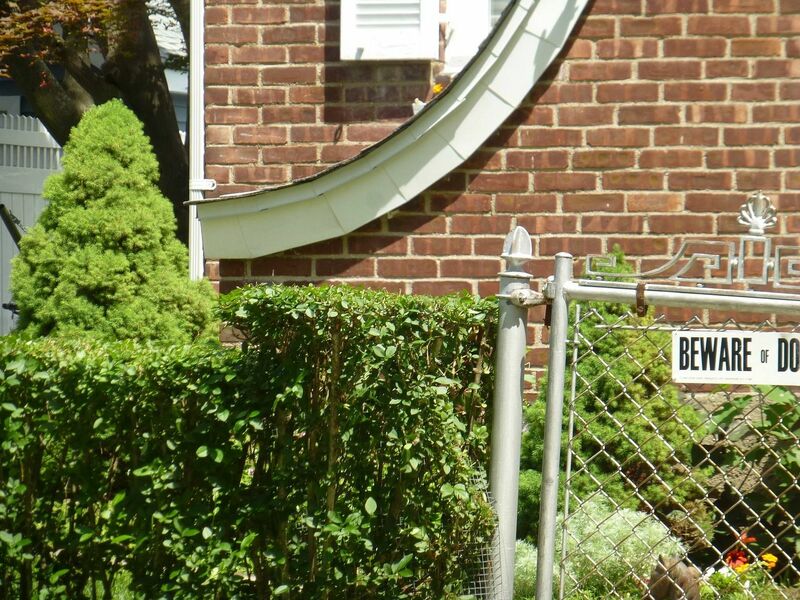 Dale Haynes (from our Sears House Facebook group) discovered the street address! 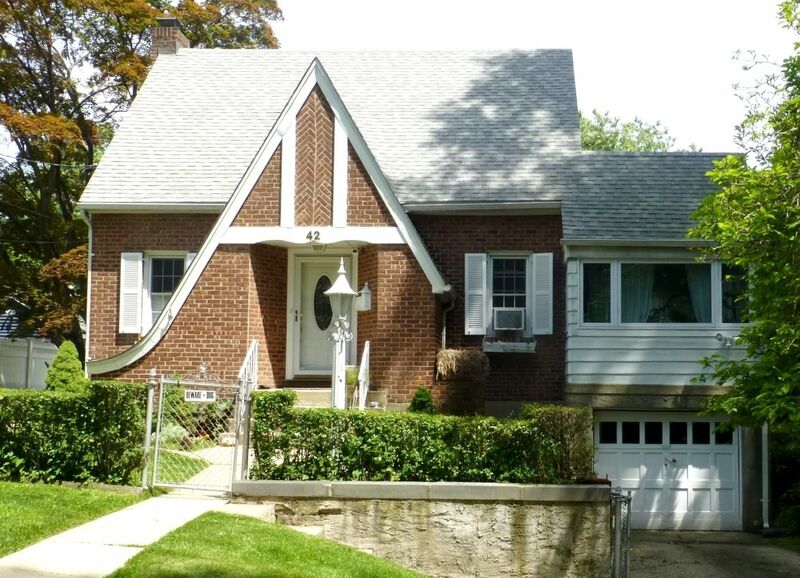 This house is on Glenside in Norwood, Ohio! Yay for Dale!!! 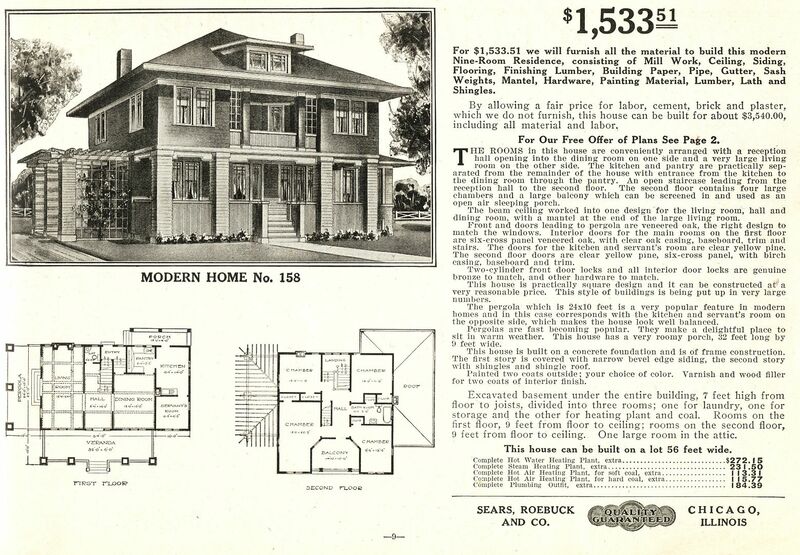 Want to learn more about why Norwood is so important to the story of Sears Homes? Click here. 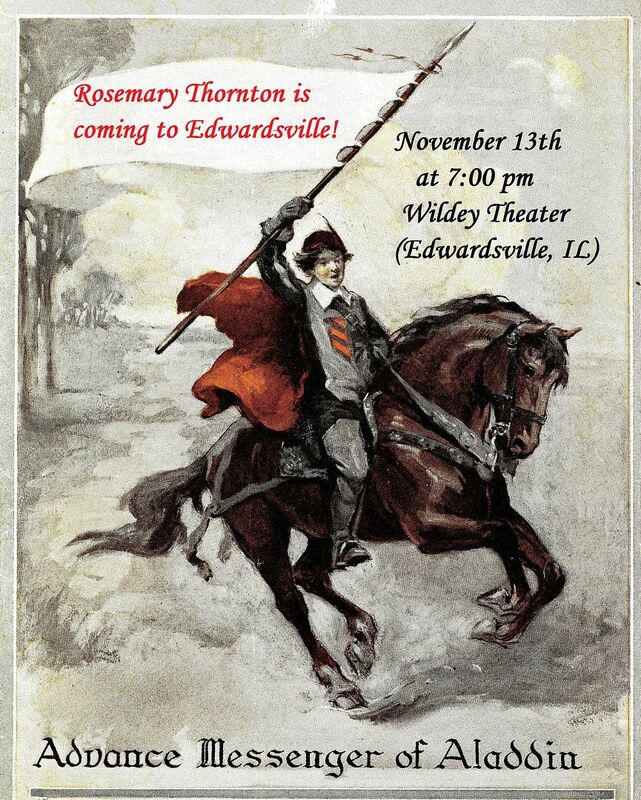 Rosemary is Coming to Edwardsville, Illinois! 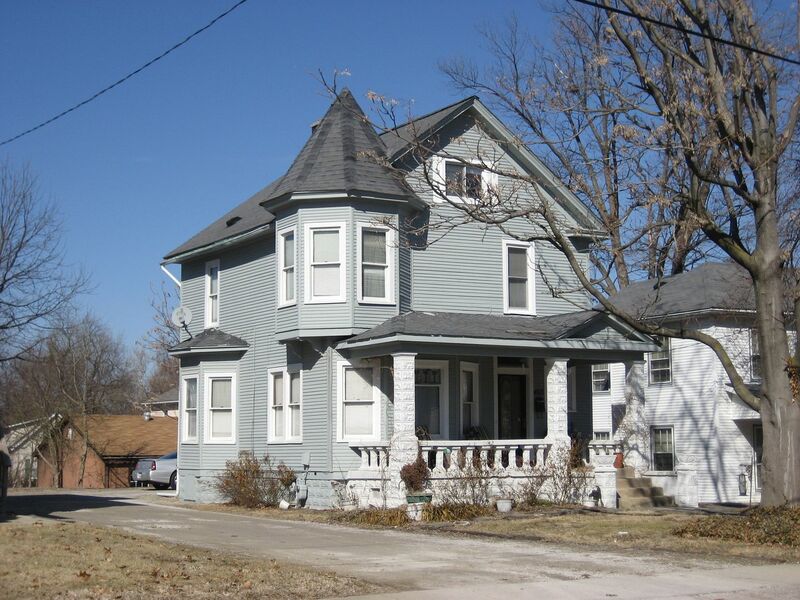 On November 13th, I’ll be in Edwardsville, giving a talk on their kit homes! It’ll be a fun time, and there will be many surprises, too! To see a preview of Thursday’s talk, scroll on down. Details: Rose will be at the Wildey Theater (252 North Main Street) on Thursday, November 13th at 7:00. Admission is free, but come early for a good seat! For more information, contact event organizer Cindy Reinhardt at 618-656-1294. 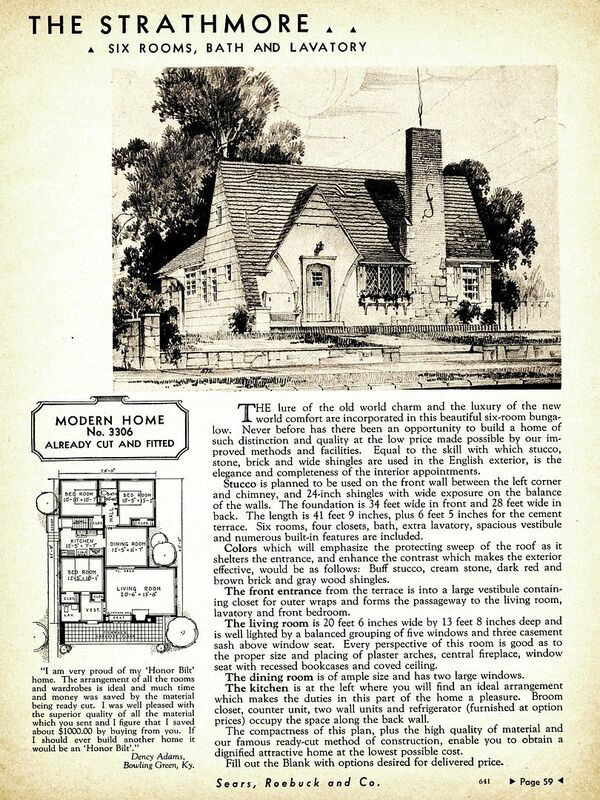 What is a Sears House? 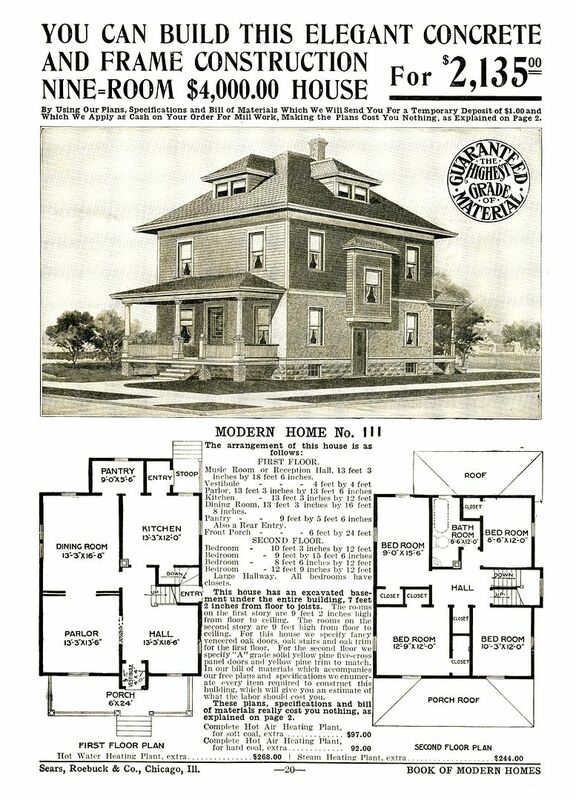 In the early 1900s, Sears sold kit homes through their mail-order catalogs. 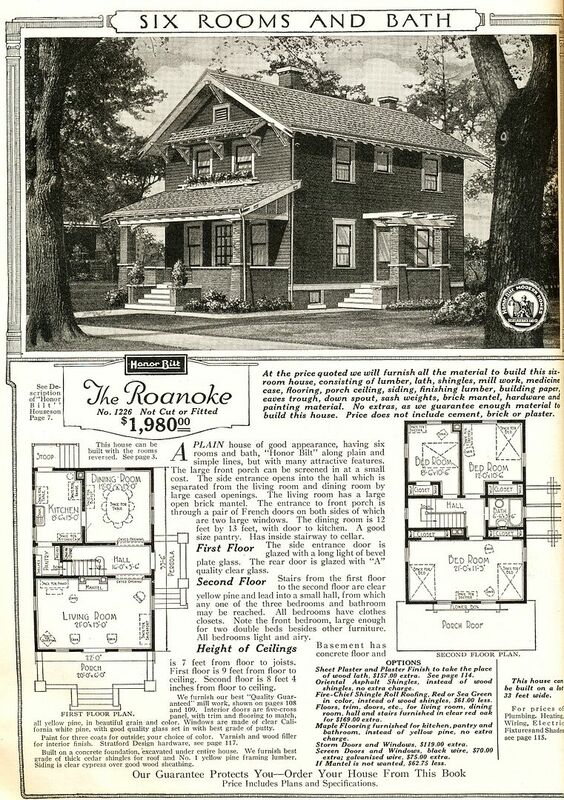 The 12,000-piece kits came with everything you’d need to build your home, including a 75-page instruction book! 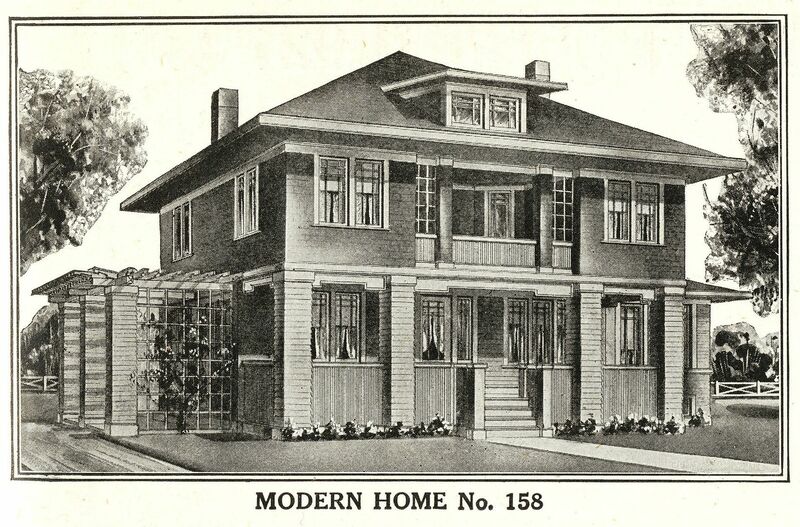 Sears promised that a “man of average abilities” could have the house ready for occupancy in less than 90 days. 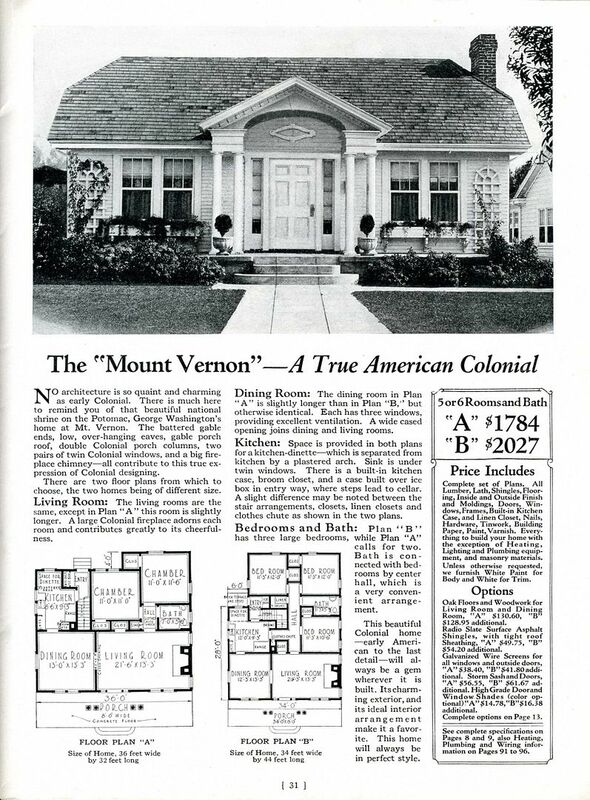 After Sears closed their Modern Homes Department in 1940, the sales records were lost, and the only way to find these homes today is literally one-by-one. Are you on Facebook? 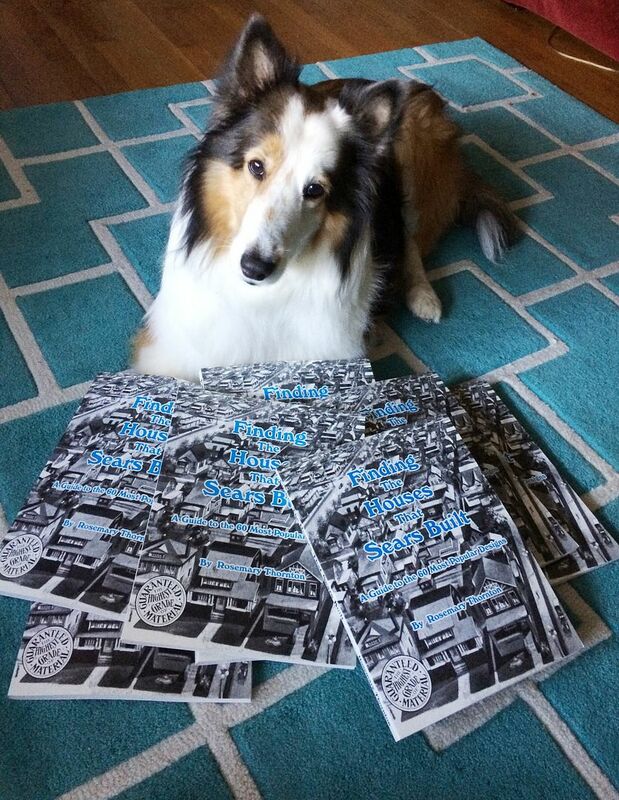 Please share the link and spread the happy news! 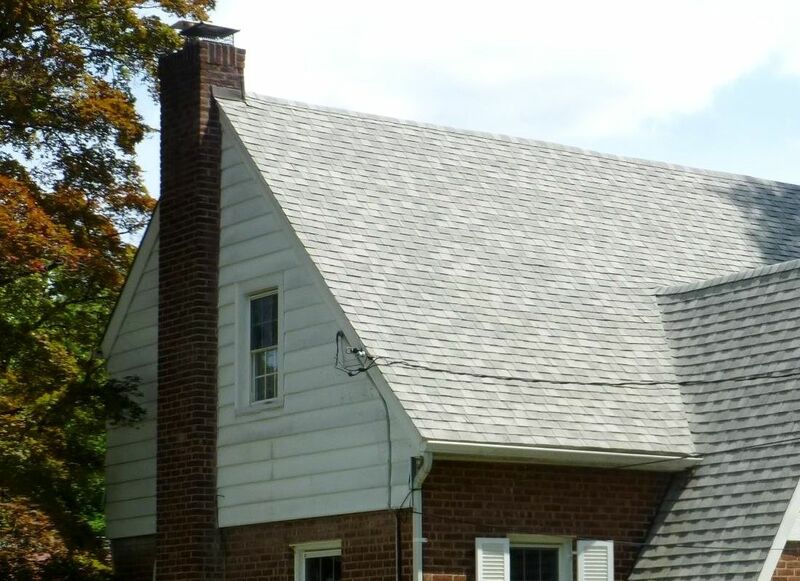 To learn more about identifying these kit homes, click here. 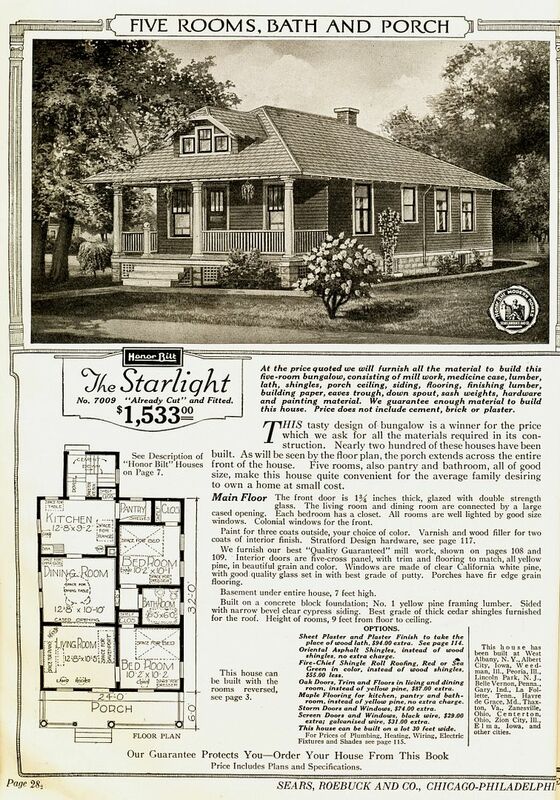 In addition to Sears, there were five national companies selling kit homes through mail order. 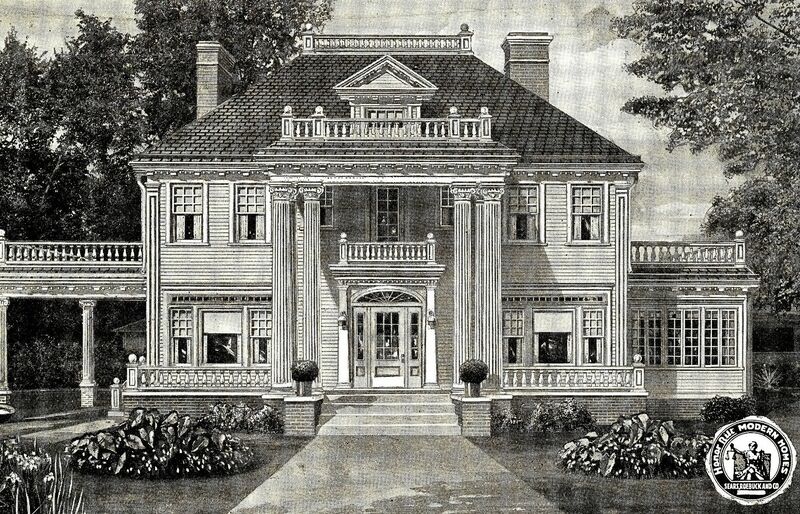 Gordon Van Tine was one of the larger companies. Shown above is the Gordon Van Tine #612. 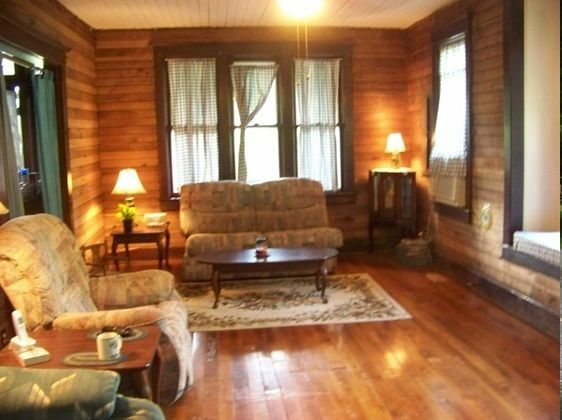 It's a beautiful home and very spacious too. 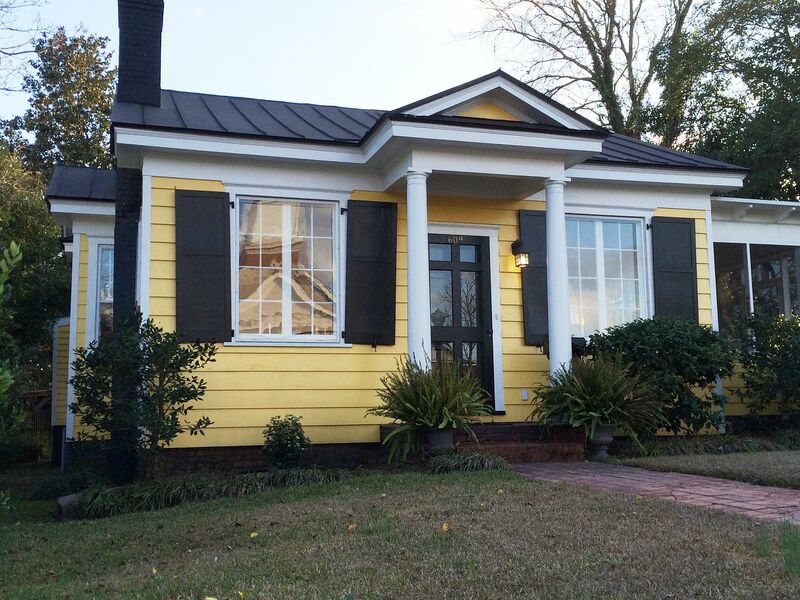 People tend to think of "kit homes" as simple little boxy affairs, but that's not accurate. Here's the Gordon Van Tine #612 in Edwardsville. What a beauty! 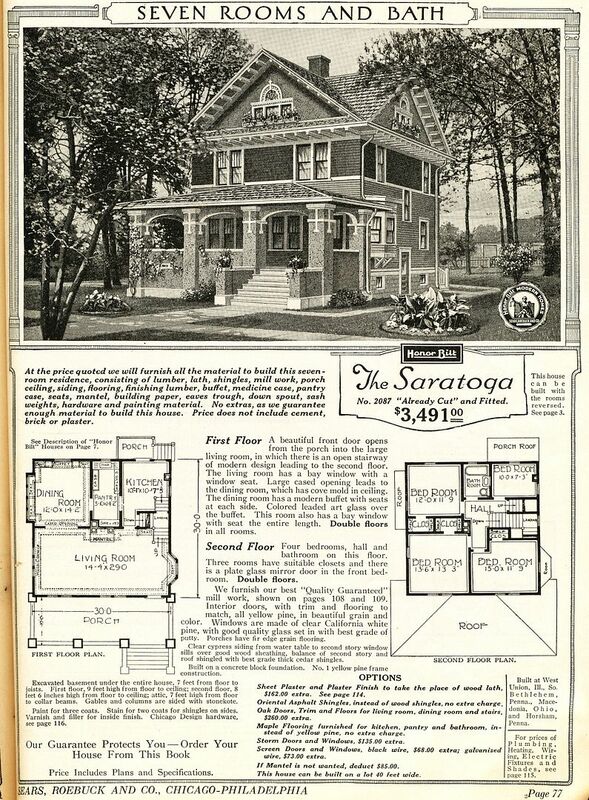 Here's the Sears Hazleton, as seen in the 1916 Sears Modern Homes catalog. 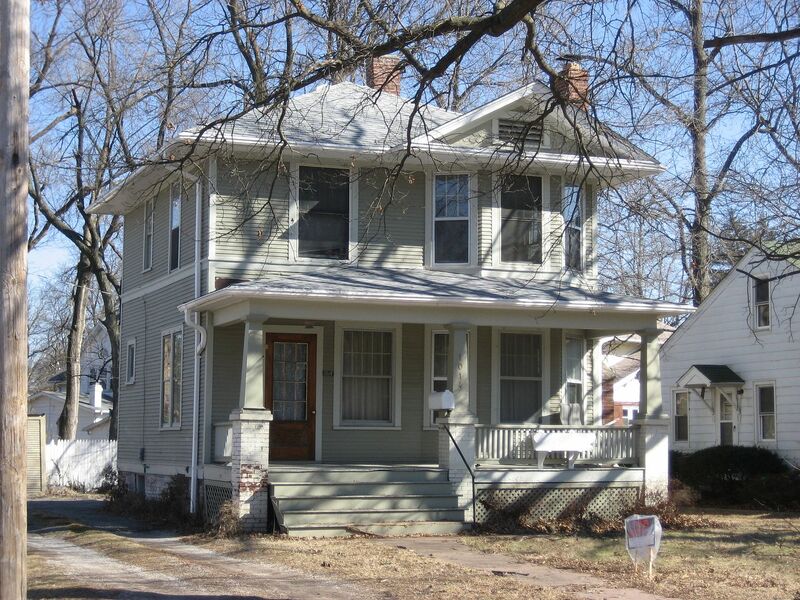 And a perfect example of The Hazleton in Edwardsville. Just perfect. 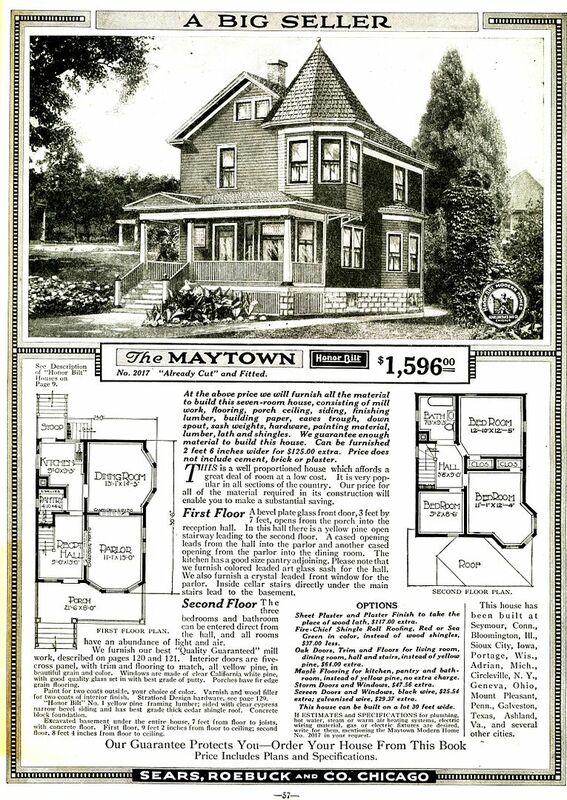 The Sears Maytown was a popular house (1919 catalog). 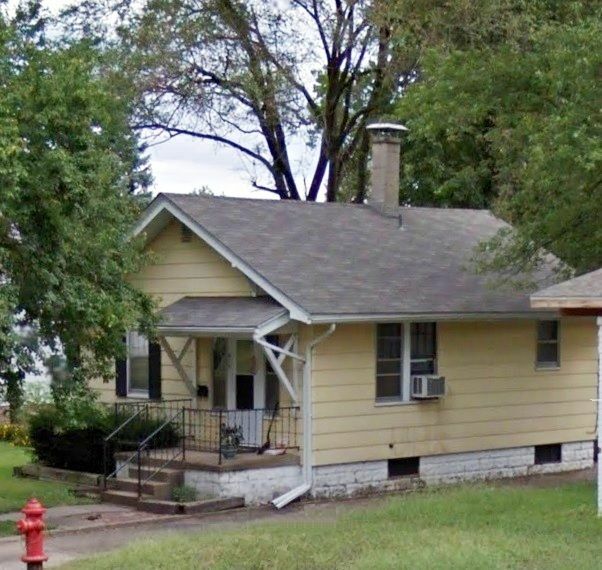 I'm told that originally, this was a Frat House for SIUE. It seems to have survived. 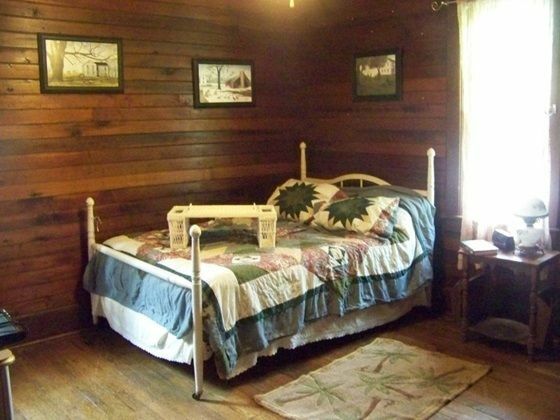 Years ago, I talked to the homeowner and told them what they had but they didn't seem too thrilled. That was at least 10 years ago. 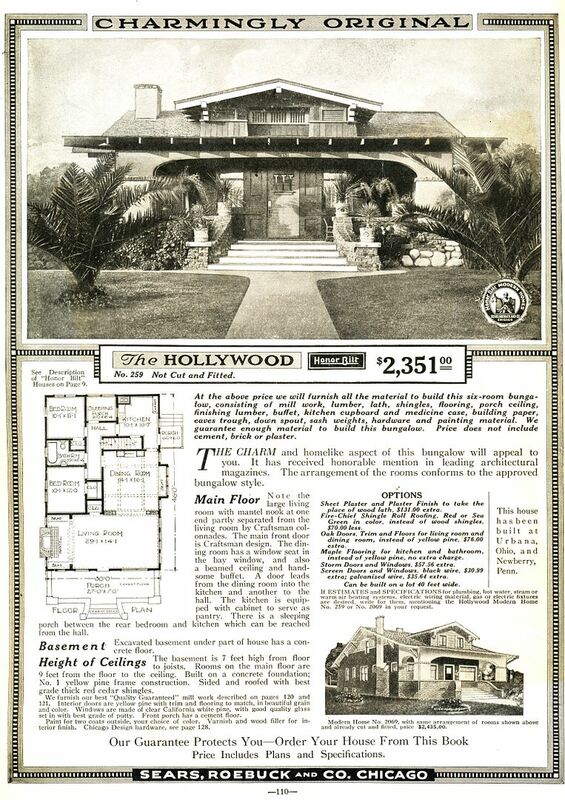 One of my favorites: The Sears Hollywood (1919). 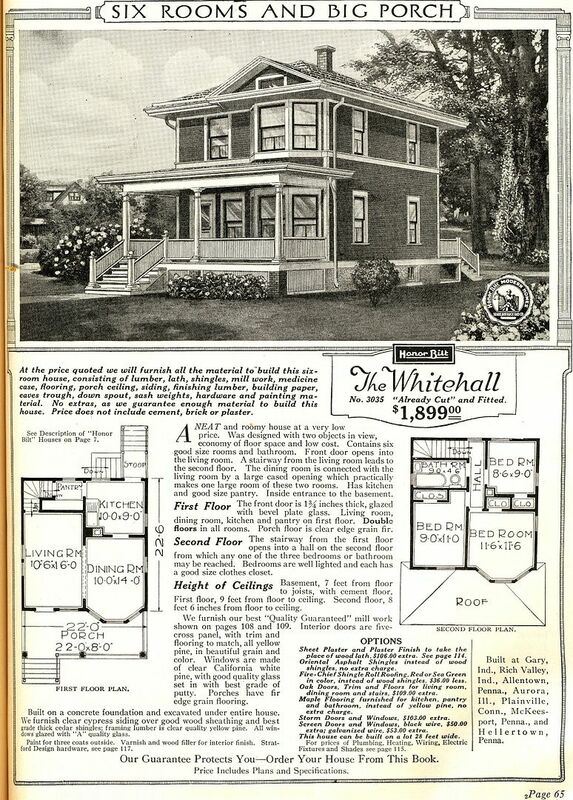 The Sears Whitehall was one of Sears' most popular models (1919). Another perfect example in Edwardsville. This photo was taken in March 2010. 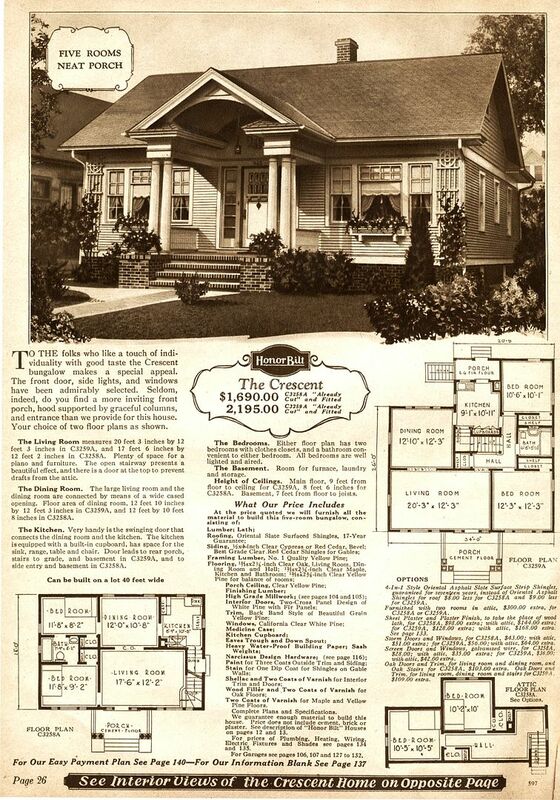 The Sears Crescent was another popular model (1921). 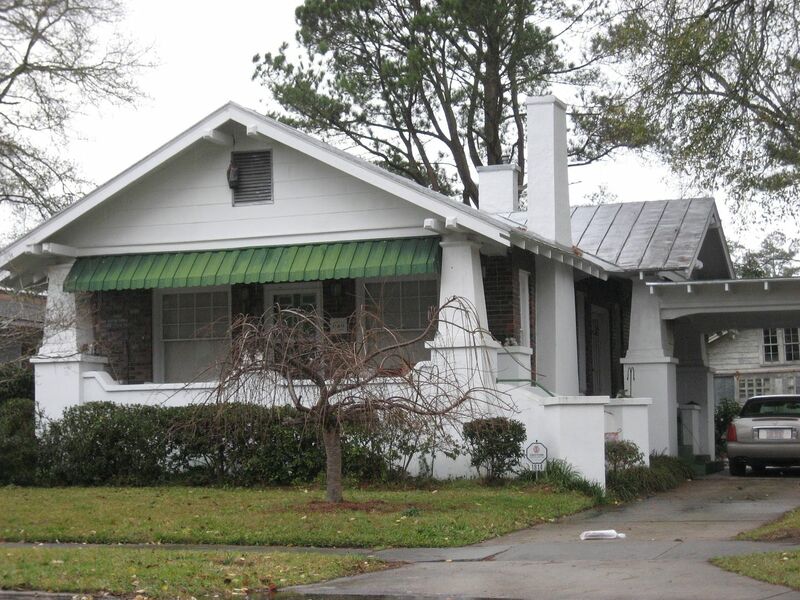 Is this a Sears Crescent on West Park? I'd love to get inside and figure it out! 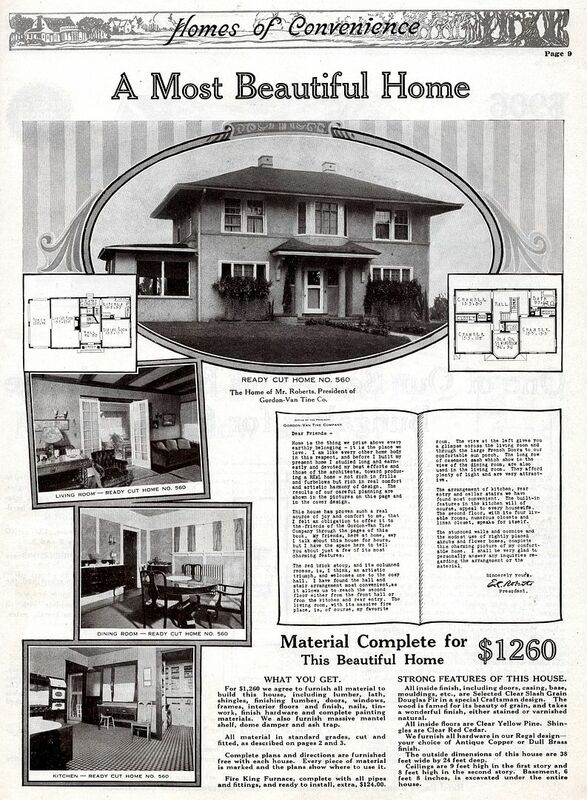 Montgomery Ward was one of the national companies that - like Sears - sold kit homes through mail-order catalogs. 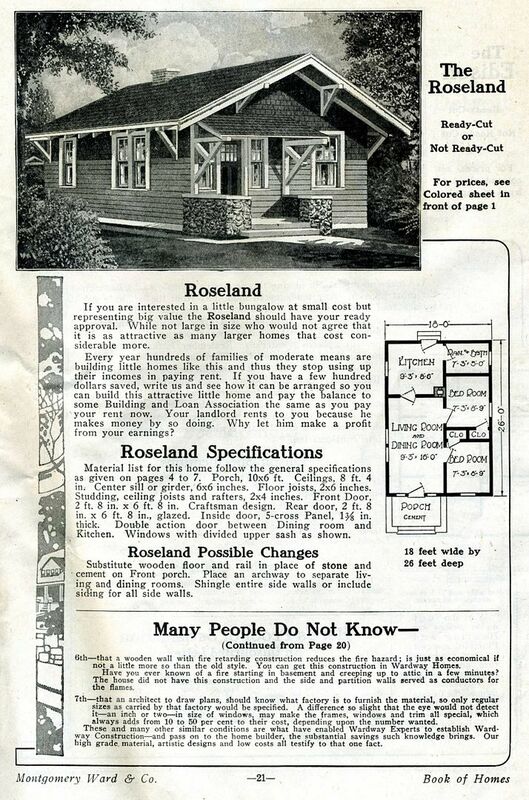 Some of their houses were quite simple, such as the Wardway "Roseland" (1919 catalog). Rachel Shoemaker spotted this little Roseland in Edwardsville! 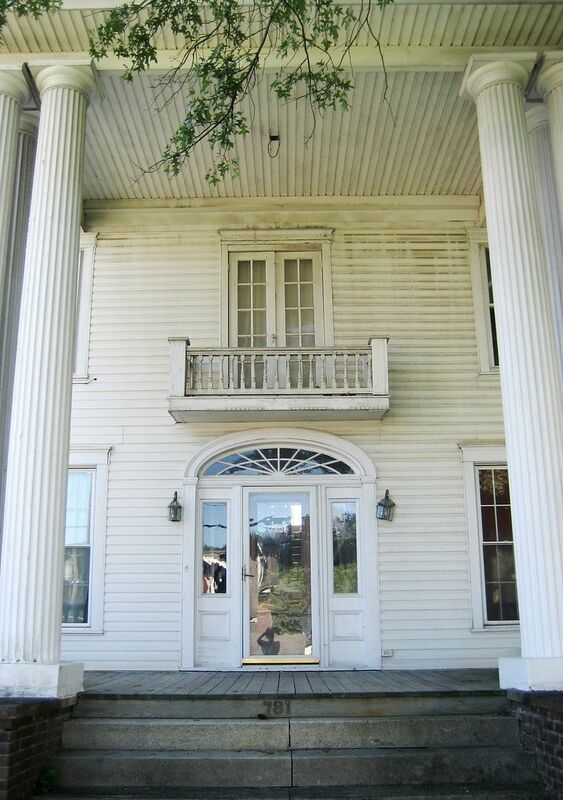 And its distinctive front porch is still intact! Do these folks know they have a kit home? Probably not! For more information, contact event organizer Cindy Reinhardt at 618-656-1294. 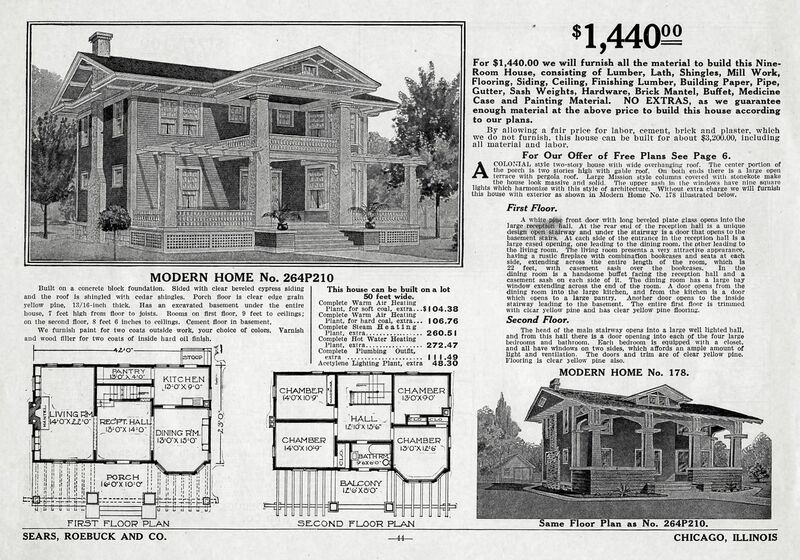 Why was the lumber marked on Sears Homes? 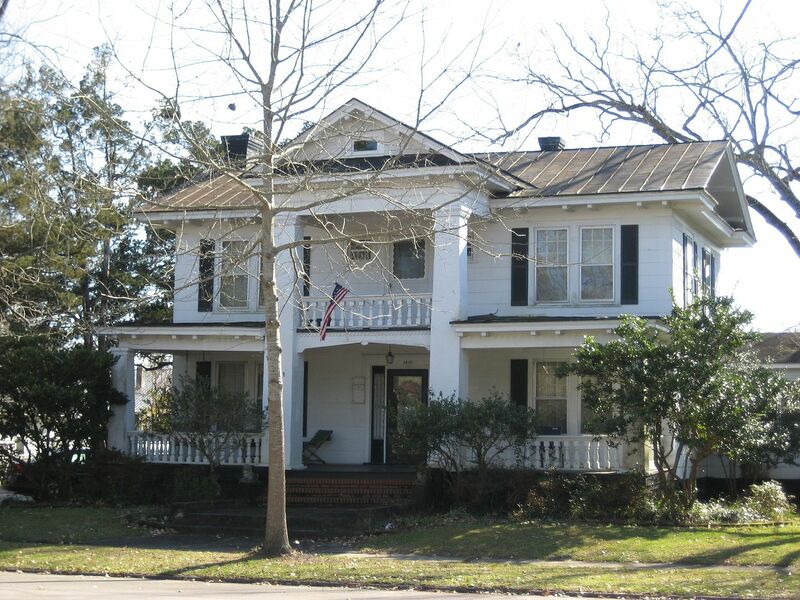 Learn more about the mill in nearby Cairo, Illinois.